We connected from LAX through Heathrow to Munich. Uneventful, except that I was smarter this time and packed us a lunch to eat instead of relying on their (icky) food. Travel Story: The couple in front of us, older than us by about twenty years we figure, seemed mighty uncomfortable on the plane. She got up and down and up and down and just as we pulled into the gate, bolted for the bathroom. Upon returning, as we all stood waiting to get off, she announced out loud, that all of us sitting around her may have noticed that she was sick but don’t worry that her illness was not contagious, just something that happened to her when she flew. Okey, dokey. A little too much information, I think. But as we toddled out after them, all of our luggage in hand, it was apparent that they were ill-equipped for the journey up to the main airport and beyond and their wheelchair hadn’t arrived. They looked lost. I felt sorry for them, but really couldn’t do anything for them. Dave and I discussed this later and decided that they thought they were 50 years old, just like we think we’re 30 sometimes. A common problem. I decided we should start making age-related adjustments, and NOW. Okay, maybe later, just as soon as we get back from Munich. Just for the record, London Heathrow is a big airport with too many people and too many gates. However they have nice security people who still had one of our iPhones saved after we left it in security. That was a heart-stopping moment. We took the train into the city center, then transferred to the U-Bahn, or their mass transit system, which is very efficient. Then to the Hotel Printzregent, where we are staying. Love the pillows. We think this is the same room we stayed in last time. 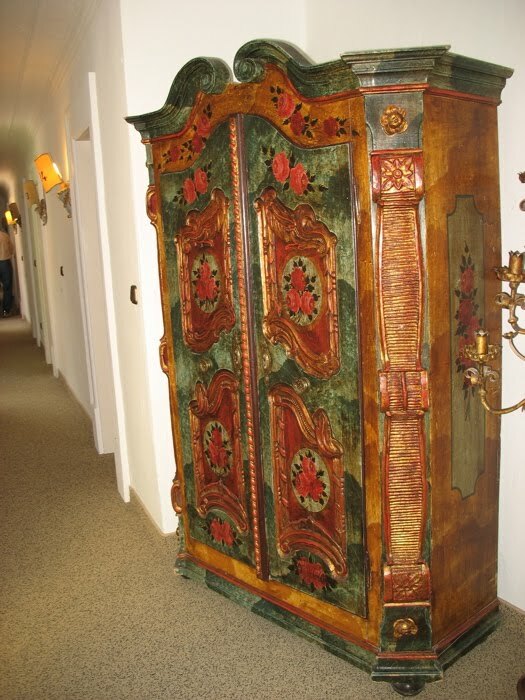 An armoire in the hallway. The weather is posted everyday on the wall. Back on the U-Bahn and to Marienplatz, a central square that is ground zero for tourists. We joined them all on this fine Saturday afternoon, the weather a bit crisp, but sunny. 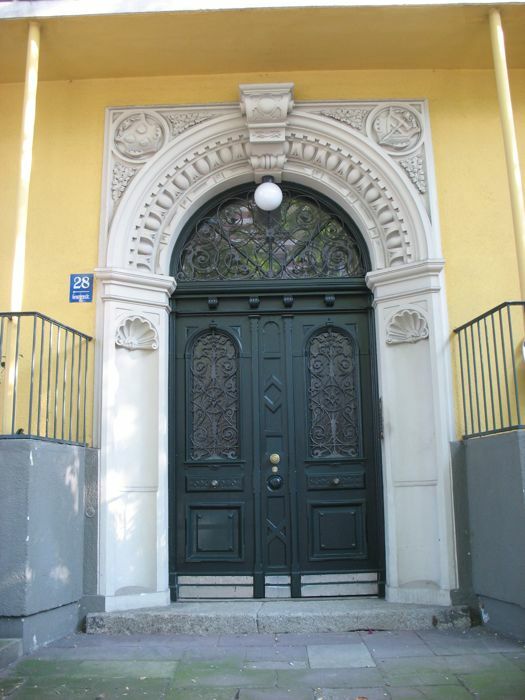 The large door to the New Rathaus (or Townhall), which was built between 1867 and 1908, in a neo-Gothic style, or so the guidebook says. I had gone to Borders before the trip to choose a guidebook for Munich. I chose it on the basis of weight, so some details are missing, but it has a great map in the back. 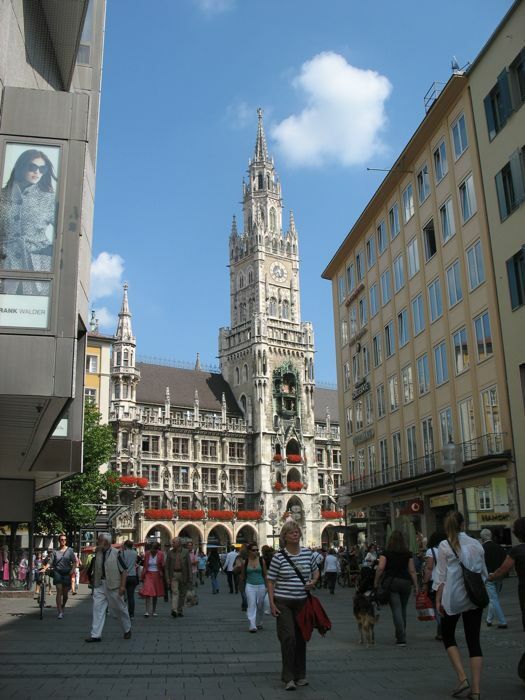 The “Neues Rathaus” also houses the Glockenspiel, the famous chiming clock with moveable figures. Doorway out to the Marienplatz. 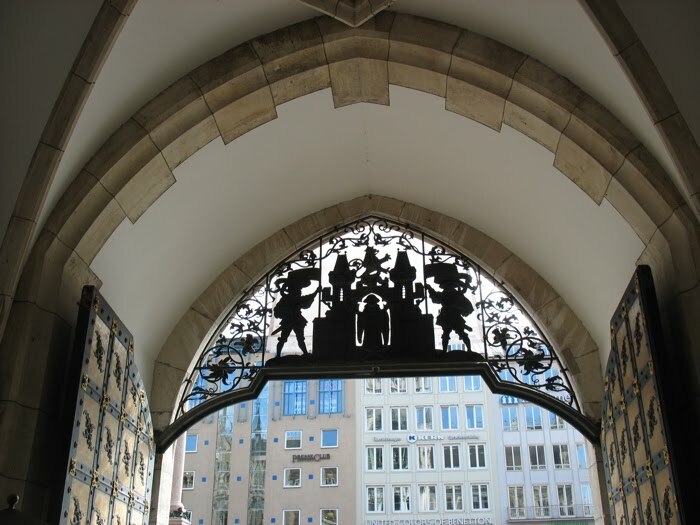 Doorway to the inner courtyard of the Rathaus. Love the frog. First you notice the buildings in a place, then the people. This waitstaffer was checking his cellphone messages. The long white apron is typical for Germany and we also saw it in Prague, too. 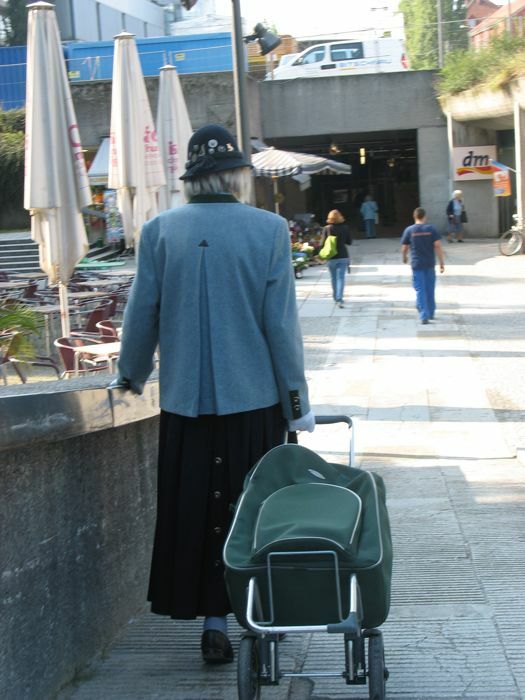 An older couple in typical Bavarian dress. We also noticed this group below, all decked out in their leiderhosen, and hats with feathers. We also loved the guy wearing socks with his sandals. Signs of the impending Oktoberfest are all around us, especially these cookies with ribbons through the top. Make of lebkuchen (gingerbread), they are heavily frosted with designs and lovey-dovey and good luck sayings. 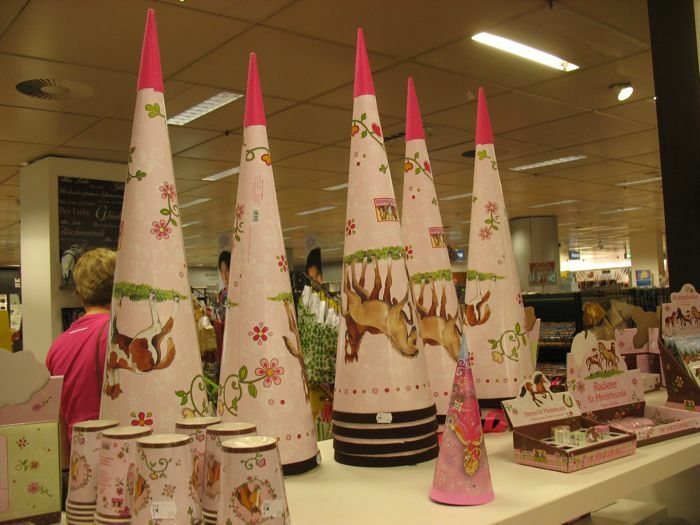 We started seeing them everywhere, in the shops and in shop windows with trachten-moden (traditional dress), the cookies looped around their necks. I asked a shopkeeper if this was typical, to wear them around their necks. Oh yes, she replied. But first we drink the beer. Then the cookies go around the necks. 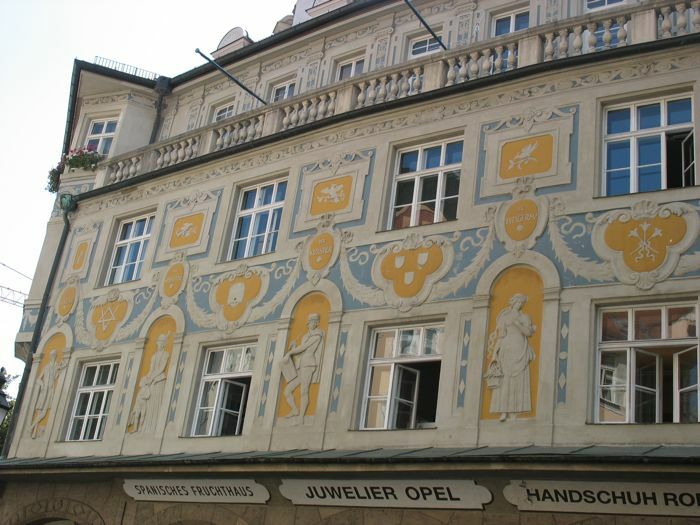 Many buildings have unique painting and designs, very Bavarian-ish in style. We like it. This monk, with his outstretched arms is found on the tops of buildings, and of course, on the manhole covers. 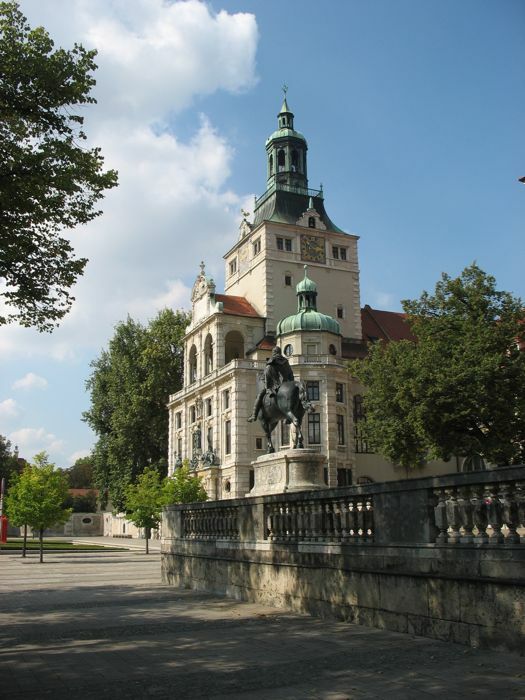 He’s one of the motifs we see repeated everywhere, as Munich means “of monks.” Read the linked article for more info. The dancing figures of the Glockenspiel in motion. I did take some video, but left the passwords to YouTube home. Check back MUCH later, for updated video. I know, I should be noticing the BMW store, but that’s way out of town. Okay, so we decide to try and get something to eat. We think it’s time to eat, it may actually BE time to eat, but the night is falling and we’re tired, so after looking at a few different restaurants, we stop here. The travel guru Rick Steves always says to watch out for places that bring you a menu in English. And Russian, Chinese, Italian and Spanish, but we’re too tired. So we get a cranky waiter who spoke perfect English even though he kept yelling at me that he didn’t (that was when I asked him what “Swabian noodles” were.) I suspect he had no clue either. Anyone? Sometime the translations are more trouble than they’re worth. We couldn’t get out of there fast enough. This shop has its Oktoberfest garland all ready: greens with bunches of pretzels tied together with a distinctive blue/white diamond ribbon. The blue/white diamond pattern is like the Bavarian theme, found everywhere. I think it’s also on the Bavarian coat of arms. 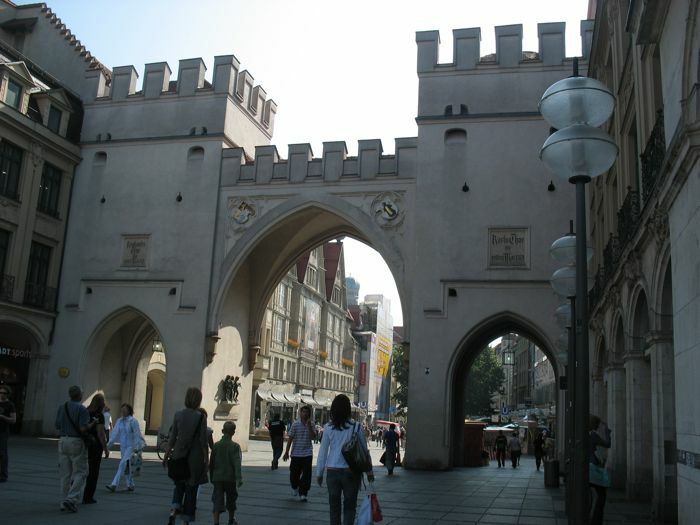 We walked down the street toward Karlsplatz, another large square, only it’s round, where we saw our first “Tor” or city gate. We tried to figure out how to take the electric tram home, a lovely form of transportation, but the lines to our side of the city are all torn up. So, back on the U-Bahn, where this newer version is all one giant open car, with circular open connections where a normal train-car connection would be. Nice. And it’s nice to be here in Munich. Let’s talk food: Munich, specifically. Given the readership of this blog, that shouldn’t be too hard, as you all like food and partake in it daily. We come downstairs the first day and this sign, hanging over the fresh breads section, is an invitation. We accept, and proceed to our nice day, by starting here. We pick a corner table, put down our room key so they can track us, and head back to the buffet. Our first pass includes slices of ham, smoked cheese, breakfast sausage, bacon, a small seeded roll, a small strudel-thingie. And juice. They have three kinds of beverage on the juice bar: apple, orange and plain old water–a rare commodity around here, so I have to mention (see Drinks, later on). You can also select from their extensive list of teas (no thanks), hot coffee (ditto), and hot chocolate. My languages are all meshing in my mind so I continually call it “chocolate calda,” a mash-up of what I remember from Italy. The sausage links are not like the States’ version. Ours are mostly grease tasting, with some flavor. These are all flavor, subtle and not earthy, and with a finer texture (no small pellets of ingredients to waylay you). 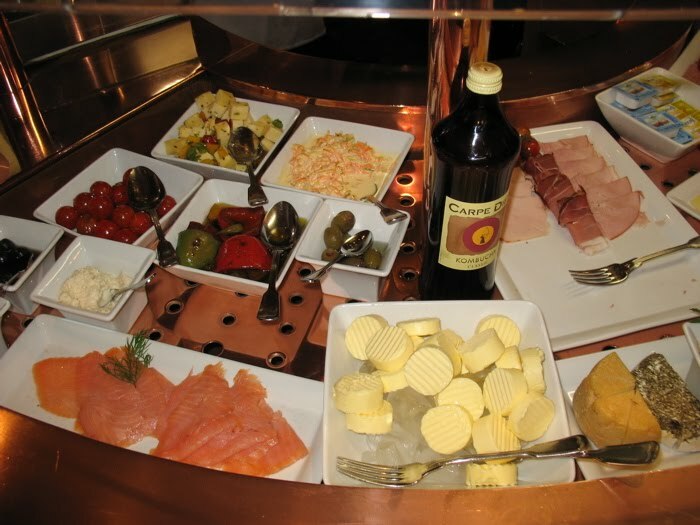 The following are pictures of their main breakfast buffet. To the left are pastries–in this case, strudel, which I haven’t seen since that first day. The weird part of the buffet, of which I never eat includes shrimp in some sort of white mayonaisey sauce, salmon, marinated olives, peppers and fish salad. The yellow round things are chunks of butter and in the lower right are soft cheeses with a variety of outside coatings: herbs, peppercorns, etc. I have tried those. The middle part, with fresh peppers (here they call them paprika), a caprese salad (tomatoes and fresh mozzerella–I guess they’re making the Italians happy, but I never had that for breakfast in Italy! ), sliced ham, meats and cheese slices. On the right is oatmeal, and past that is the fruit compote. Above those are two kinds of yogurt. Are you feeling full yet? Obviously there is a possibility of gluttony here; instead, on that first day, we merely overate. We haven’t eaten that big of breakfast since. And the Grand Finale! 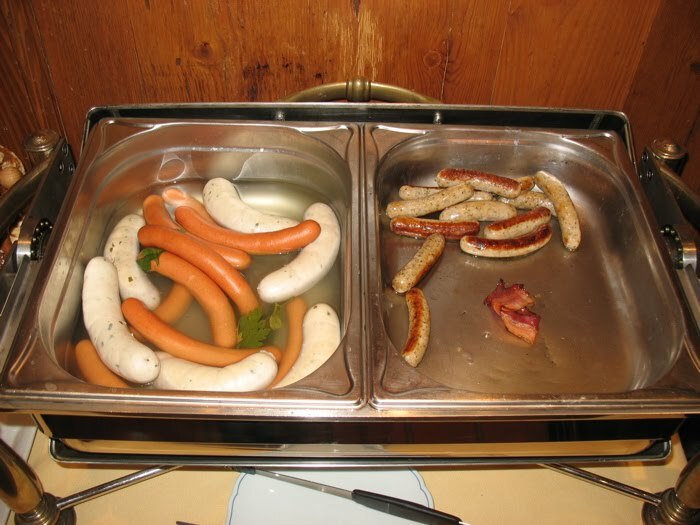 Weisswurst on the left, with some other kind of unnamed wurst (sausage/brat variety) and on the right, bacon (almost gone–it’s popular) and the breakfast sausage. 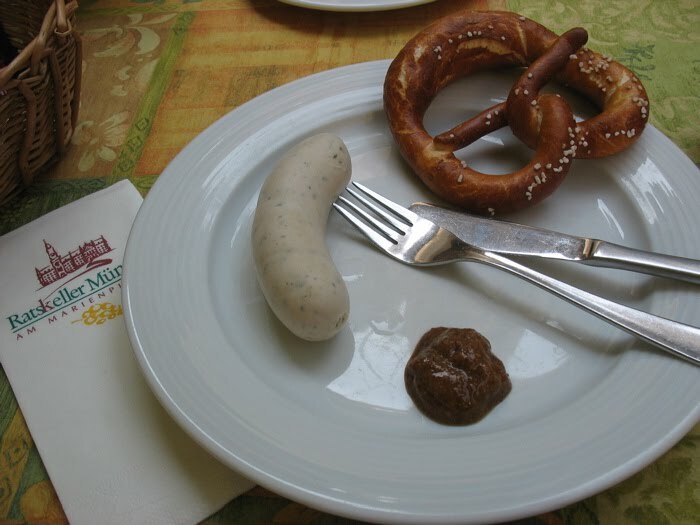 Weisswurst is a Bavarian specialty, usually served only for breakfast, for in the old days it was kept in a vat of hot water on the back of the stove and wasn’t any good past breakfast time. 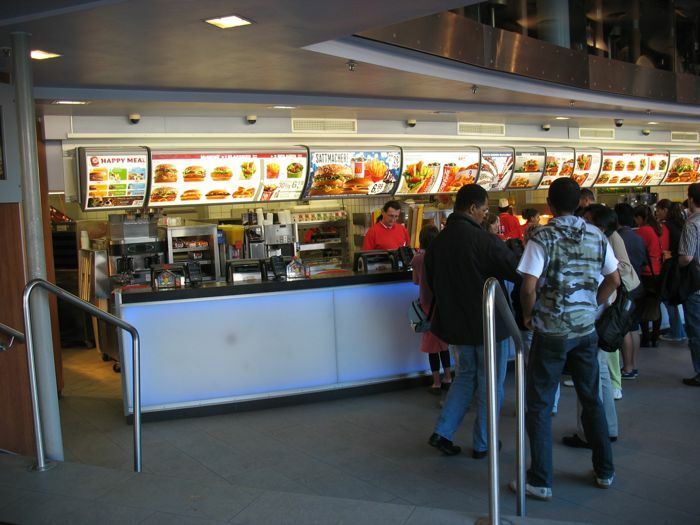 When we were here before, I tried to get one for lunch. Sorry, was all they said. I just can’t face this for breakfast. We had goulash soup that first day for lunch. A small cup of goulash soup for we were flagging and needed a little something, but were still full from breakfast. This had small diced vegetables in a full-flavored tomato base broth. Toefelstrudel, or something. It has raisins and apples imbedded in a soft cheese, all wrapped in strudel. It’s how I gained 5 pounds on my honeymoon, some fifteen years ago. We shared this. And now to my advice for those of you who want to invest wisely in today’s stocks and bond markets: buy Munich drinks. No kidding. The bottle on the left costs about $4 and the apple juice (fizzy) on the right cost about the same. We haven’t figured out how to get tap water yet (the cranky waiter from the first night told us he wasn’t allowed to sell it–yeah, I know. Just give it to us free. . . ) but we’re trying to figure out a way around the fact that our drinks costs as much as our meal. Okay, so our meal cost more on this night, but it was the same story: $5 drinks. And these aren’t even the famous brew that Munich is known for. Apparently there is some concern here in this town that the underage are drinking too much. They believe that one reason is that the soft drinks, or water, costs more than the ales and beers, so it’s cheaper to buy an alcoholic drink. We noticed. Non-drinkers are at a definate disadvantage here. The first thing the waiters will do is ask you what you’d like to drink. I think Germans come in knowing their favorite ale and blurt it out. We are dumb tourists who ask to see their menu and then figure out the cheapest thing and go for that. Last night I told Dave to just consider it our “tip,” that is to say, that we Americans are used to tacking on 15 to 20% on each bill, which they don’t do here (usually you round up to the nearest Euro, and in nice restaurants, add 3-4% or a bit more). Our drinks are the equivalent of that 15%. We’re trying to wrap our heads around this. Really. Dave liked the little piggies with the coin in their mouth in the upper left. On the upper right, are the boars, with coins in their mouths. We try to figure out their customs by pure conjecture. Are these good luck treats for Oktoberfest? For year-round? For fun? We also saw large cones everywhere. Think ice cream cone, but made of cardboard wrapped with colorful paper and LARGE, like 18″ tall. I finally asked, and was told they were for the schoolchildren and were filled with candies and small toys for the first day of school. School begins here September 14th, so they are for sale everywhere. Dinner that first night was at a local Bavarian specialty restaurant: HofbrauKeller, in Wienerplatz, about a ten minute walk down the street from us. We’d been here before in 2004 and I’d written down what I had because I liked it: Bratenpfandl, which is a leg of pork, a piece of suckling pig and some duck, served with red cabbage (had a touch of spice), a potato dumpling and a semiknudel (or bread dumpling). It looks like a lot, but by the time you carve out the bones and the skin, it’s a more normal portion. 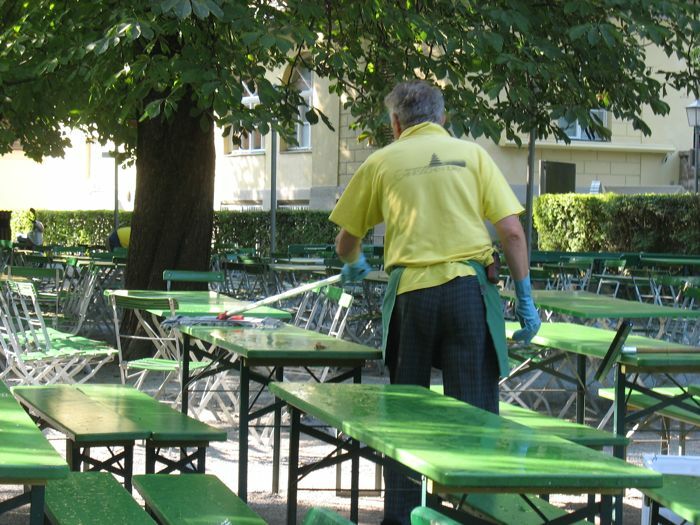 HofbrauKeller is also one of the top ten Beer Gardens of Munich, with a huge area for table under a canopy of spreading chestnuts. We didn’t see it (I’m quoting from the guidebook) but apparently they also have a children’s playground. I guess it’s so the children can guide the parents home afterwards, but Dave tells me his friend Dietmar could quaff five of those very tall glasses of beer and still function. Dave had Beef Rouladen “Housewife Style” (they’d given us an English menu). It was beef filled with bacon and pickled cucumber, served with red wine sauce, butter vegetables and mashed potatoes. The pickled cucumber? A pickle. Ah, Apple Strudel with warm vanilla sauce. How We Still Stay Married and Happy After 20 Years. On our honeymoon, we were in a Bavarian eatery and had each ordered their version of the prix fixe meal: salad, entree and dessert. True to habit, Dave finished first (he was the last in a line-up of six children so learned to eat quickly). Being a new bride, I offered to give him a bite of my dessert. He left me a bite. So after that we get out a fork and split it. Right down the middle. Monday’s breakfast was more of the same–er–less of the same, and for lunch (after a very long walking walking walking day) we finally stopped about 3:30 in the afternoon for a salad and a pretzel and Highway Robbery Drinks. It was a great salad. Tuesday’s lunch was at the Rathaus in Marienplatz. Dave was at his conference, and I was out schlepping the town, so I decided to be bold: have weissewurst and pretzel. This was the pretzel basket. In America, you can eat whatever’s in the basket and it’s the same price. Many places here dock you by the piece (another discovery on our honeymoon when we tried a little bit of every bread in the basket and were charged for “5 gebaken” or something. Surprise! ), so I was careful to only eat one. He had to show me how that yes, this was what I had ordered, by gesturing: pick up the spoons Dear Tourist, plop that link over onto your plate and with the bretzel (that’s what they call it), enjoy. It wasn’t until later that I’d read the bit about them being served in the hot water. Okay, some amount of trepidation here. What if this is completely gross? What if I hate it? I squeezed out the sweet mustard on the plate, cut off a piece of the wurst and cut it into a smaller piece, and then again (it was now the size of a chocolate chip) and dipped it heavily into the mustard. I tried not to make a face as I put it into my mouth. Surprise! It was very good. It had flecks of herbs throughout so it was a very mild flavor. The texture was even more velvety than the breakfast sausage served at our hotel–this was almost like a firm puree and very appealing. The next bites I took were more normal, and coupled with the pretzel, a fine lunch. I still can’t wrap my head around eating them for breakfast, though. The view, looking up, from my table. Dave had heard about the restaurant Kafer from a foodie friend of his, and that it was VERRRY pricey, but amazing food. The view above is not that restaurant, but instead is the bistro downstairs, at a fraction of the cost. They close precisely at 8 p.m. (this IS Germany, after all) so as not to interfere with the dinner business of the restaurant. Dave got home from his conference, did some emails at we arrived here (after a short walk from our hotel) at 7 p.m. It took a while for them to translate the menu for us (very nice people) but we were all seated and ordered by 7:10 p.m. Bread, not charged by the piece. 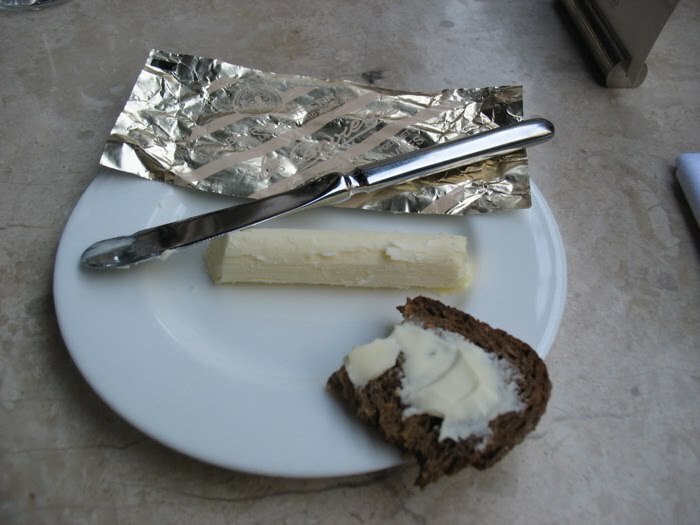 The butter was placed on our plate by the server, a small round tube wrapped in foil. I had duck liver ravioli, served with morel mushrooms. An earthy, but delicious, taste. Dave’s was a vegetable strudel with a white creamy sauce, atop a bed of steamed vegetables: turnip sticks, white asparagus, broccoli and cauliflower. Light and refreshing (we shared bites of both entrees). Dessert was a raspberry tart. Instead of a pastry crust, which I find sometime to be tough, this had a shortbread crust with a light filling, and raspberries that they’d just picked from their vines out back. . . or so it tasted. We split this, too. And how does a tourist get through a long day of hiking around? Chocolate! In all different flavors! We see lots of surface decoration on the houses around here. This is a prime example. 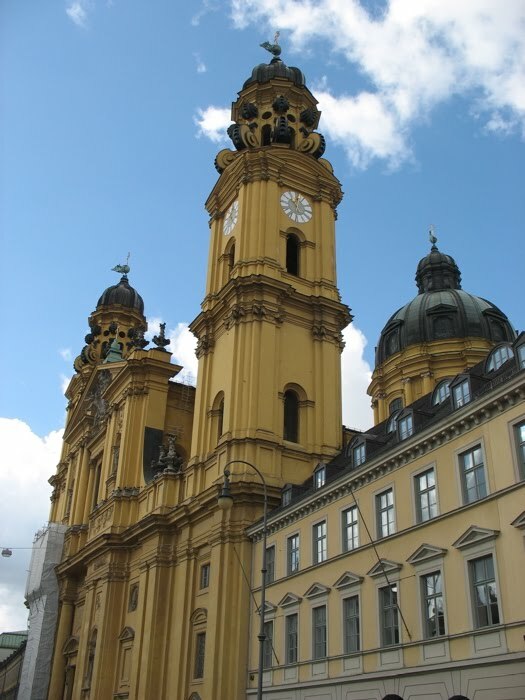 We catch the 100 bus, which takes it over to Odeonplatz, where we get off in order to head to the Theatinerkirche, or Theatine Church. Stunningly yellow, it’s a bright contrast to the buildings around it. Mass was being said, so we entered quietly and took a seat in the back, pulled in by the live choir singing to a full-throated organ. The rest of the mass, when there wasn’t the choral music that I love, was time for reflection on my family–after all, it was the Sabbath. 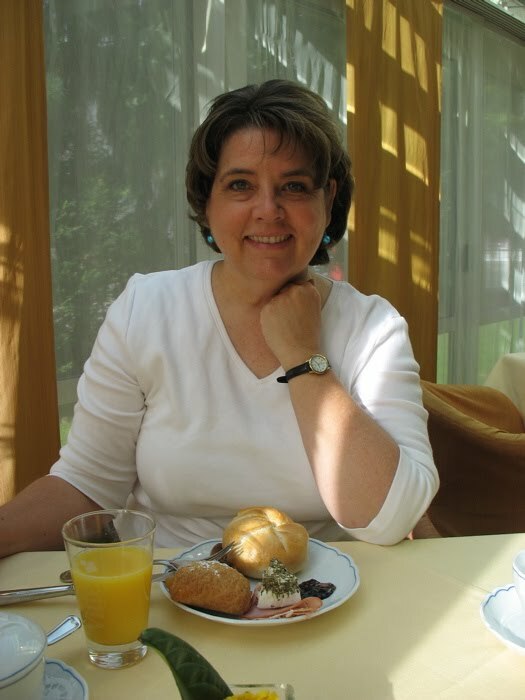 I thought about Barbara, with her heart disease, and was saddened for her. I think the sadness came from the somber tones of the mass, and certainly wasn’t helped along by the scene below, taken later that day. One of the princesses of the Wittelsbach realm had lost her daughter and this was a memorial to that event. I thought about each of my children after that. I had written about them in the last journal I’d kept when we had traveled to Munich five years ago. So much had changed. Some situations were better, others were still trials of a different sort. 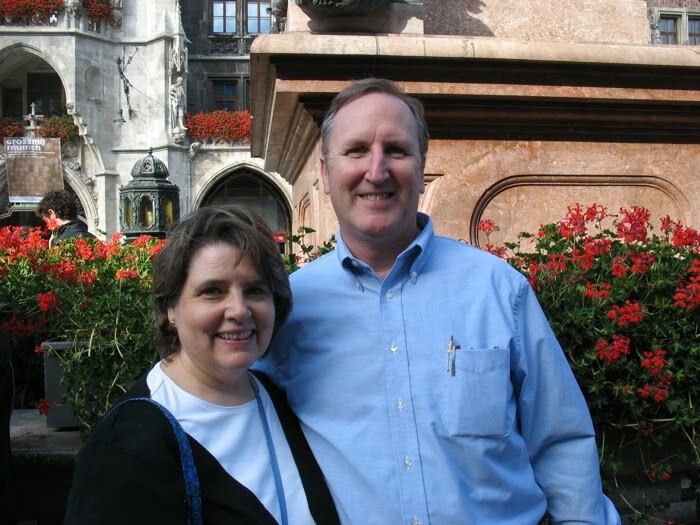 We’d included our brother-in-law Richard in every prayer that trip, newly diagnosed with cancer, and now we include his widow, who is off to a yearlong mission of service at the LDS temple in New York City. It was interesting to get that five-year perspective, and as I sat in this soaring church, immersed in the strict choral harmonies of some ordered German composer, I thought of how Heavenly Father must view us with his perspective and wonder how often we miss the boat about what’s most important in life. Maybe, as illustrated by the memorial above, it is in relationships, keeping them going, figuring them out, loving more completely, repenting where necessary and most importantly–learning to forgive. For as I’ve gotten older, I think the whole grand plan and design rests on Christ’s shoulders and his twin gifts to us: repentence and forgiveness. We went back Monday, when the sun was shining more brightly to take more photos of this church, our favorite. Look for a future post. 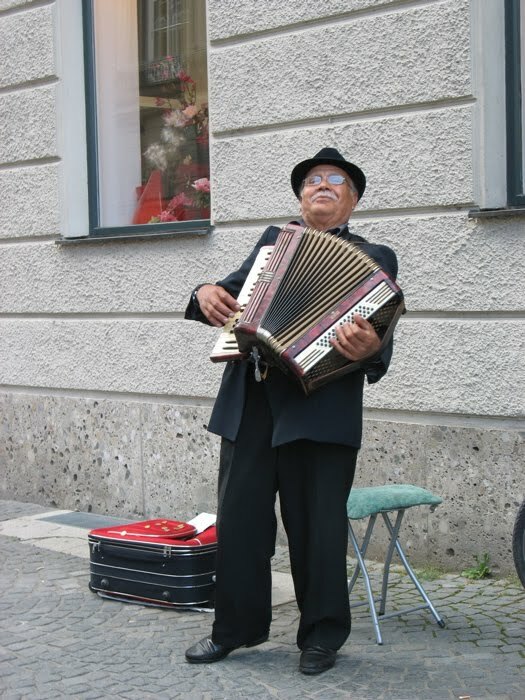 Music man, outside the church. 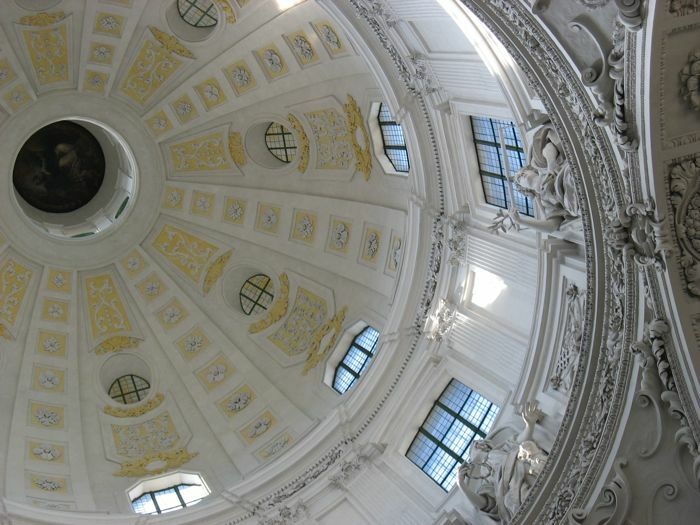 We headed to the Residenz next, Munich’s great royal house. We had wanted to go back there every since that fateful day when, as Dave so delicately put it, we had a computer malfunction and lost the photos of the previous trip. (For the record, I was the computer malfunction; still learning a new program, I erased the photos.) It was interesting to stroll around the Residenz, remembering places and sights we’d seen and enjoyed, but really hadn’t remembered because of the lost photos. “Oh, I remember this,” one of us would say, and the other would nod in agreement. Or we’d remember what was next in the tour. We decided not to get the audiophones as we’d done that before and forgotten it anyway. Such an interesting thing, this memory. Like the sea washing the beach clean every day, and our photos are the collected and saved seashells in the glass jar at home. Look for a separate post on the Residenz at a later day. 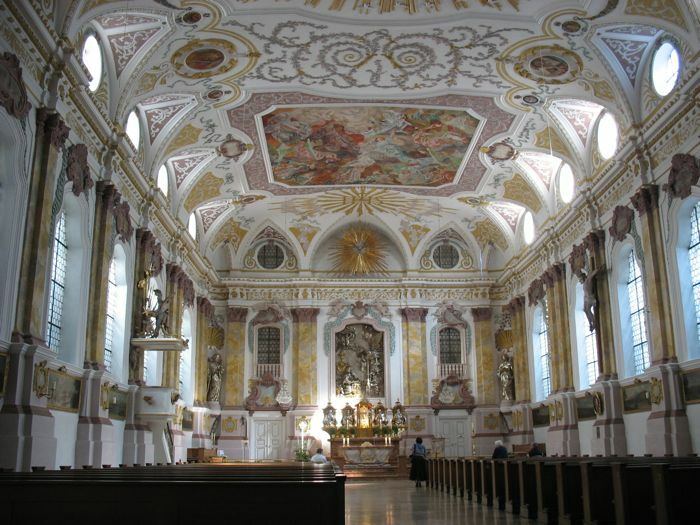 Since it was Sunday, we decided to make churches our focus, and went to Frauenkirche next, built in the 15th century. 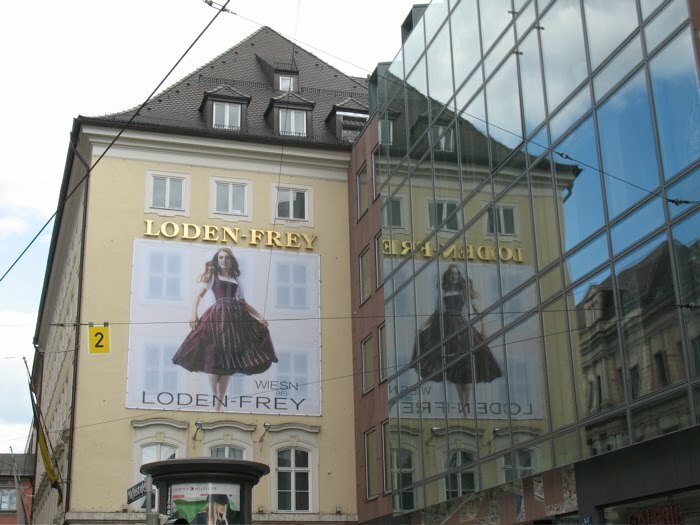 Walking across Munich, we see Loden Frey, the store dedicated to Loden cloth and traditional wear, reflected in its neighbor. More dirndls. I love these dresses! The door handles of the store. We headed to Asamkirche, but it was closed for renovation. On the right is the front, and on the left, its neighboring jewelry store, which was closed (everything is closed on Sunday). While get off at the next stop and while we wait to cross, we see the BierBus, or Beer Bus. Have keg, will travel, as long as the people sitting down peddle hard–it’s the means of locomotion. Yep, the surfers. 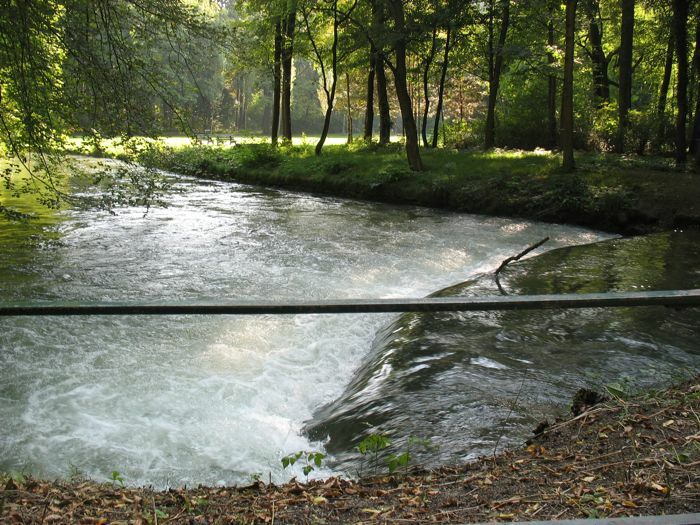 This stream comes out from underneath the bridge at a good clip, hitting some sort of pipe, which creates a moving wave. 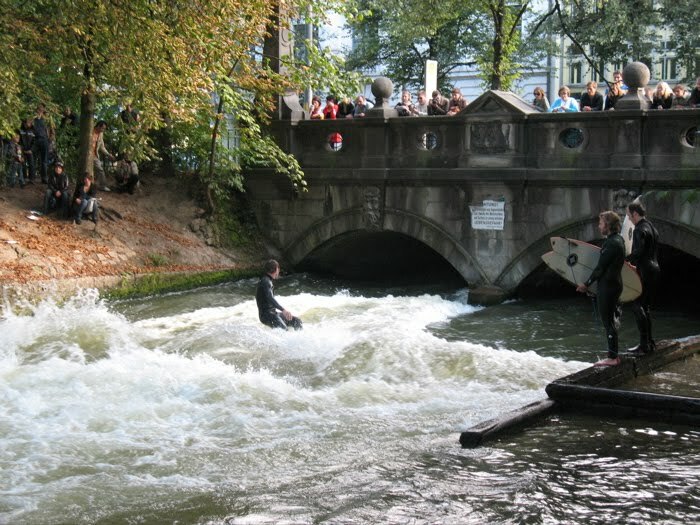 The surfer would jump in, take a few passes back and forth, then dive into the froth behind them, giving the next person a chance. It was fascinating to watch and I’ll post video later. Dave later commented that it was a very efficient way to surf. We kept walking. Dave stood in the middle of the street to get this one. No wonder they call us crazy tourists (don’t worry, I kept watch). Playing with our time-lapse photography at the base of the Friedensengel (Angel of Peace). 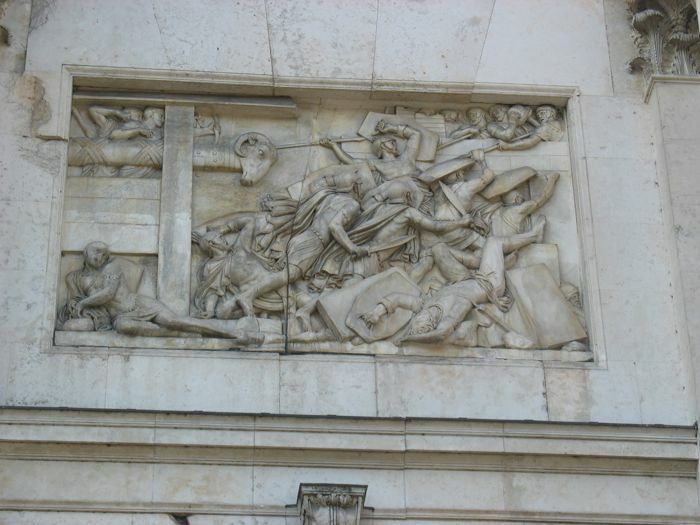 It was completed in 1899 and commemorates the Franco-Prussian War of 1870-1871. It is based on the Greek Goddess Nike, before she became a shoe company, and stands twenty feet tall from its baselt ahough looks can be deceiving (I thought it was much taller). This area of town (near Europaplatz and about 2 blocks from our hotel) is a nice area, with big houses and is quieter than the city center. Up on top, the base has four mosaics; this one was lit up by the afternoon sun. And that’s our first full day. Not bad, for jetlaggers. But don’t worry. The Nazis, in all their tidiness, photographed this place ad nauseam, so with the fragments of this palace that were left, the archived artwork and treasures, all those photographs (and I’m sure some war reparations money), they rebuilt the thing. Dave and I both agree it’s one of the most impressive royal houses we’ve seen, perhaps because it’s a highly edited collection. The Shell Grotto. I’m going to get Dave busy on the weekends building me one of these. We call this the Dripping Medusa statue. What you can’t see is that the rest of Medusa’s body is at this guy’s feet and water is squirting out of her neck, too. Very inventive. The next room is called the Antiquarium because they keep antiquities in there. This guy is not one of them. The scale and shape and size of this hall is so harmonious. It’s a pleasure to walk in and be in, and perhaps you can see from the people in the picture, it’s very large, but full of light and interesting things to look at. Because this is a blog post, I’m going to give you the edited verion, the highlights according to Elizabeth. One is the ceiling corner of the next room (below). I have three more corners, but won’t post them, because you get the idea from just this one. I liked the old-fashioned bee hive (looks like a hut of straw) and all the gilt bees attached to this ceiling. 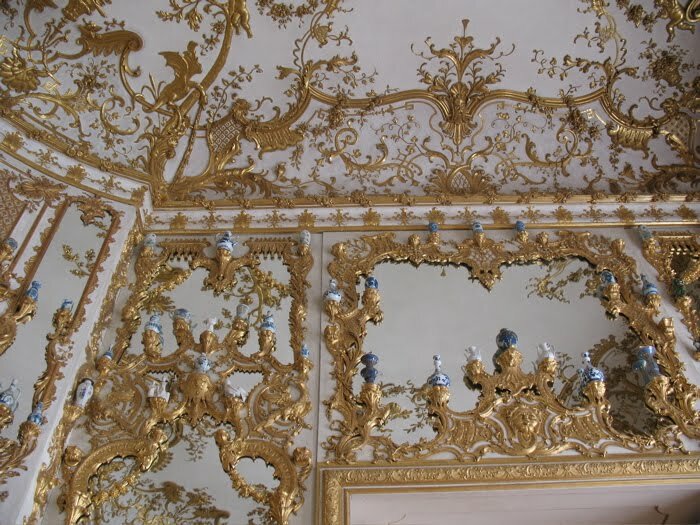 Money was no object, if you were a king, and so much of the ornamentation attests to this fact. 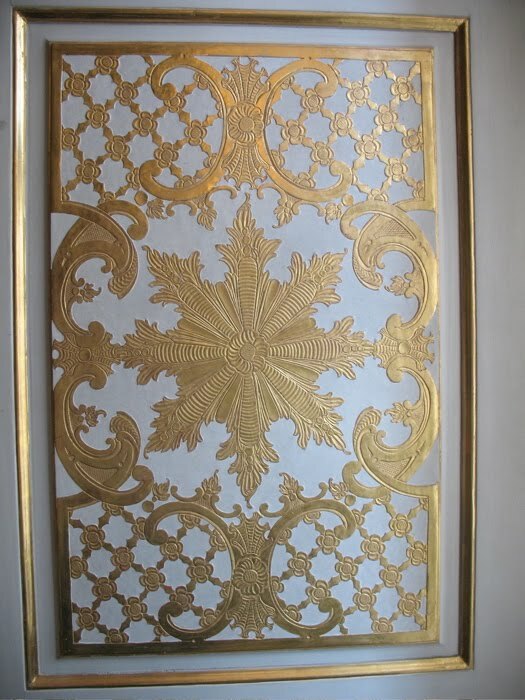 But when I think that much of this is a reconstruction, I was amazed at the skill of the twentieth-century artisans who were able to put this decoration onto the walls, ceilings, doorways, hallways, everywhere. In the other four corners, they had a ship, and a palm tree, and a dragon on fire, not to mention the scenes in between the corners, with full-scale people lounging around showing the times of the day (didn’t photograph those as I was enamored with the bees). 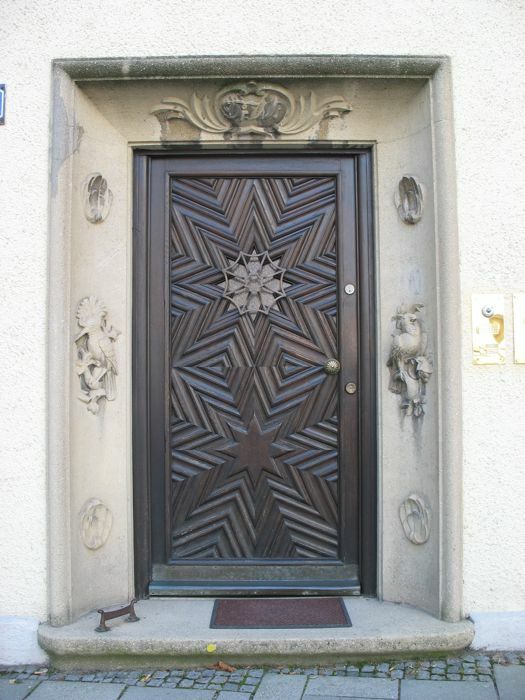 The door to the Four Horses Salon and adjoining Kaisersaal (Emperor’s Hall). Last time we were in Munich, our conference had a reception here in the Residenz with the Deputy Secretary (equivalent to our Secretary of State). The conference organizers put in to the Secretary’s office for a reception and that office chooses the place and provides the food and hor d’ouvres on their budget. We lucked out and were here. Detail of a door jamb. Here’s the big hall, with its pieced marble floors, huge paintings and chandeliers. This is the one place you can linger, as it has chairs you can sit in. The reason why the call the adjoining room the Four Horses room is that it used to have a painting of Four White Horses on the ceiling, but no longer. Damaged in the war. This sort of thing happened over and over–referring to what was there, but is no longer. I can think of many instances of this in my own life, where the perception and memory are stronger than what exists now. And then there are the other times, where I’m madly scrambling just to keep up with “what is.” Sometimes it’s tiring to relearn. This room is tiny, a small chapel just for the King not too far from the larger family chapel. It has a silver-encrusted altar, and piedra dura scenes around on the wall. Using Albrecht Durer as a model, craftsmen from Italy pieces together depictions of Mary’s life in stone–kind of like paint by number but with rocks and glue. 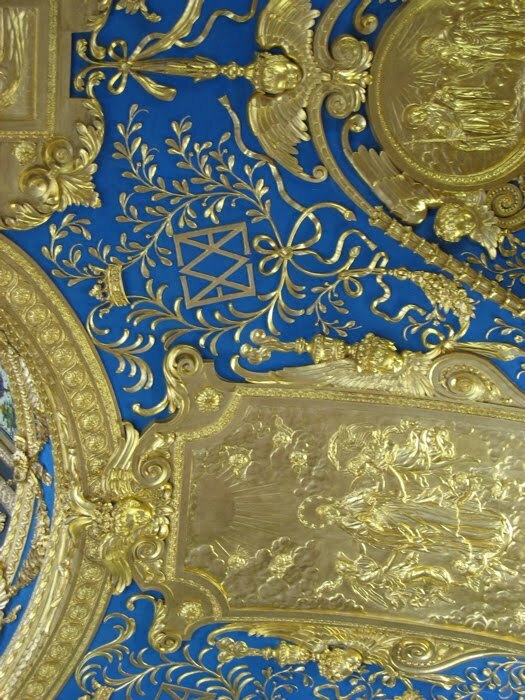 So there’s silver and black on the altar, stone all over the walls, and the ceilings are painted a brilliant blue with gilt decorations. Amazingly, it all works together. 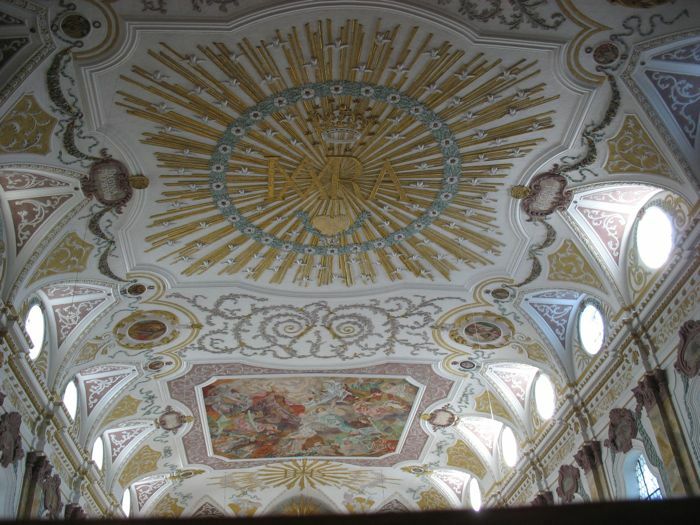 Looking up into the cupola. We were prevented from entering by a velvet rope, so the angle is skewed (the stone floors are original and they’re trying to protect them). Stone on the left, a glimpse of ceiling, then the altar. Coming out of the chapel, is this Stag Hallway. Even the plain spare walls become beautiful with the shiny marble floors and the sun shining in. This is the Green room section, repete with mirrors. Apparently having a plate glass mirror was a real sign of wealth in the 17 and 1800s and this room (and some of the next) showed that off. This fireplace is at the end of a cross-shaped arrangement of rooms, and while the photograph doesn’t really show this, it reflects back two galleries just like it. At the other part of the “cross” what’s reflected back, five galleries away, is this exquisite little mirrored room, with gilt framing holding little jars of blue and white porcelein. While Dave likes the Four White Horses area, I’m crazy for this room and the Red Cabinet (next). 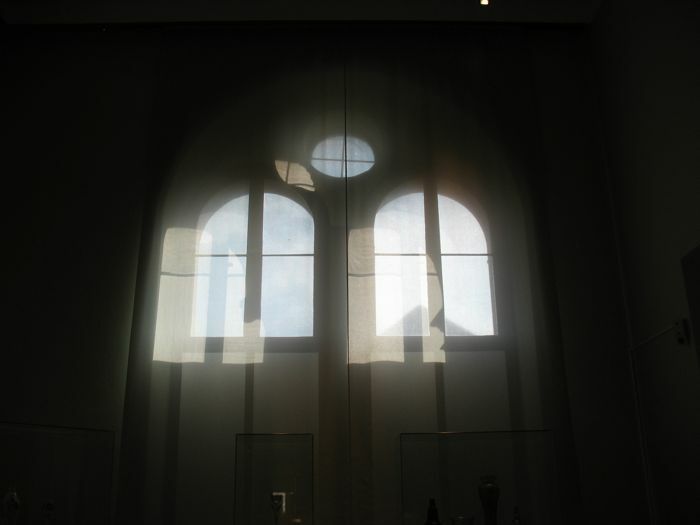 Many rooms are kept curtained and dimmed (like the Stone Rooms, which didn’t photograph well), but as soon as we arrived here, the sun came out again from behind a cloud and lit up the place. If I were a King, or his Queen, I’d spend most of my day here. This was right off of the Royal Bedroom. 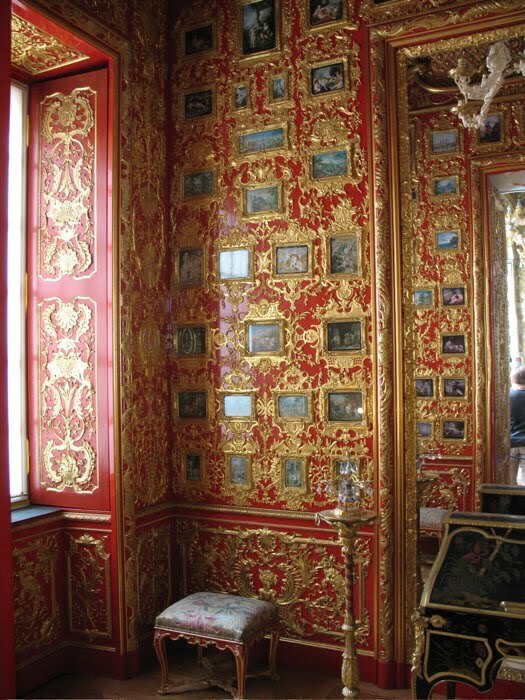 This is the Red Cabinet, a tiny room with miniature scenes covering the walls. 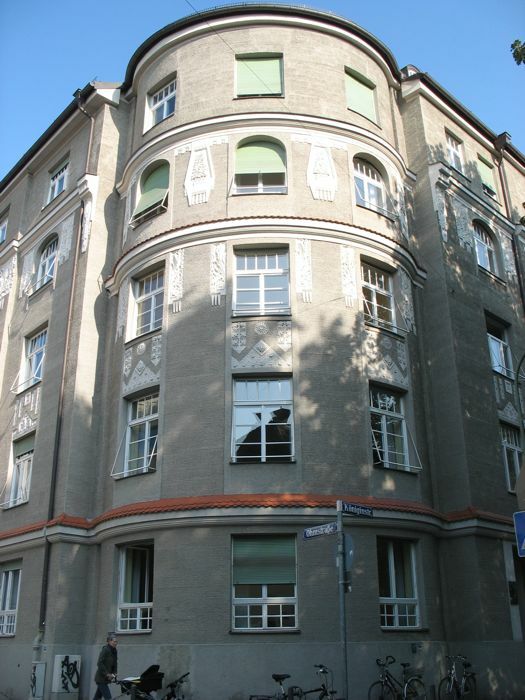 The website states that “With the exception of the two sets of doors and the miniatures, the Miniaturenkabinett was completely destroyed in the Second World War. 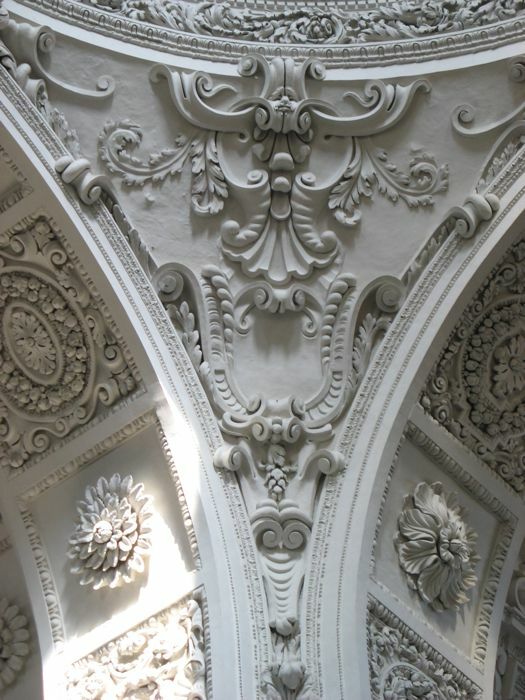 It took many years of painstaking work to reconstruct the stucco, the carving and the red japanning.” It’s stunning. The chandelier is made from ivory. The last hall of the Residenz is the Family Portait Hall (my name for it). 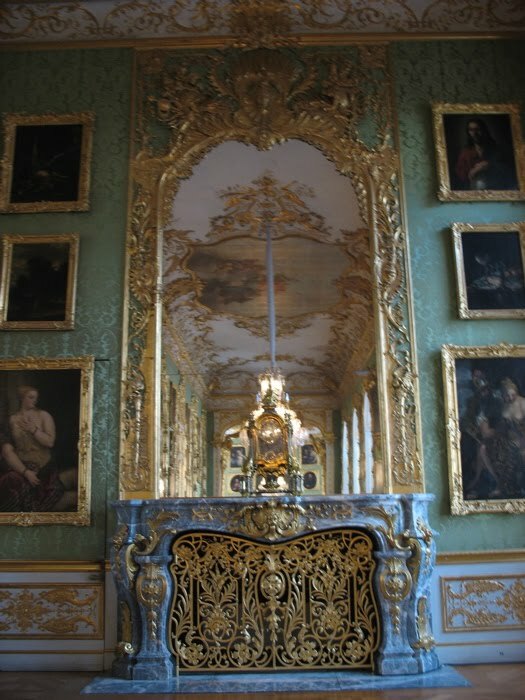 Stacked three high in gilded frames are portraits of the Wittelsbach family. We were happy to have the chance to come here again, and went out into the day, heading over to the Yellow Church (look later for a post). The Theatine Church, or Theatinerkirche St. Kajetan, is a glowing yellow church with black accents just across from The Residenz. Royal Ferdinand built it in 1662 as an honor and thanks because his wife produced an heir to the Bavarian Crown. Most men would have just brought a bouquet of flowers and her favorite chocolates, but I’m glad he was a man of the grand gesture. 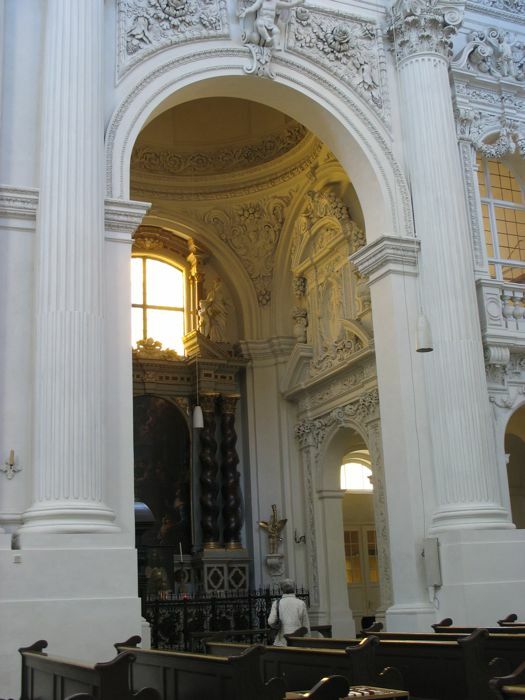 Like I mentioned before, it has an all-white interior in stucco, with the exception of some side chapel pictures and a great black wooden pulpit. I’ve seen many many churches in my travels with Dave, so the churches that keep my attention are the interesting, unusual churches. 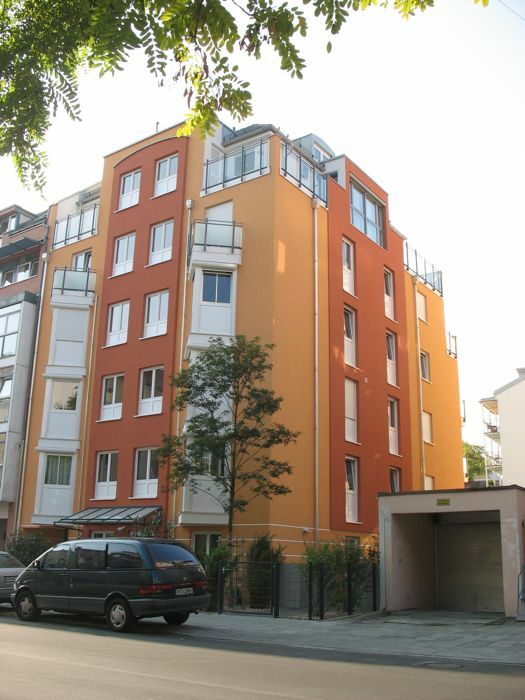 This one qualifies with its yellow exterior (with black details on the towers) and the nearly all-white interior. Most of these pictures below are taken on Monday just before we headed down into the U-Bahn. We were drawn in because the sun was really shining brightly, more so than the day before. We took many photographs, so just scroll through them at your own speed. Don’t worry, I didn’t put them all up, just enough to give you an idea. I think the putti is where the sense of humor resides in this church. 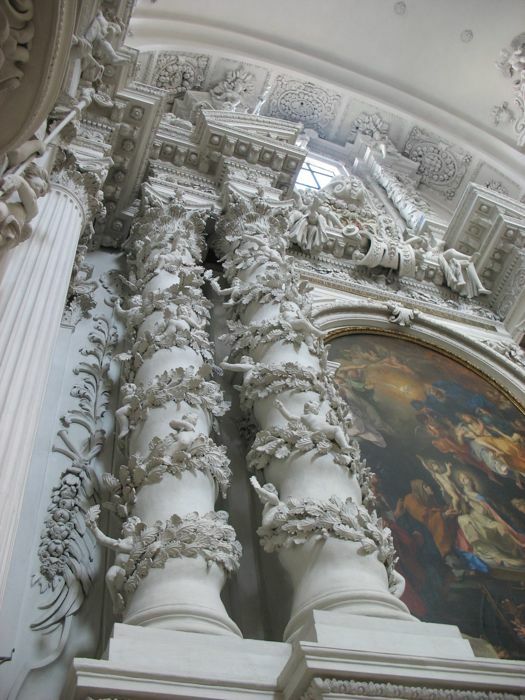 Much of religious decoration can be so somber, but not these little cherubs. A couple of them are playing hide and seek, with the leaves from the vine over their faces. I searched in vain for more information about this memorial, but all I could find was that it was for Princess Maximiliane Caroline, born 21 July 1810 in Nymphenburg (a local palace on the outskirts of Munich) who died on the 4th of February 1821 in Munich. Some say she took ill after viewing a theater performance.Her parents were Maximilian I Joseph, King of Bavaria and Karoline, Princess von Baden and the child’s nickname was “Ni.” All of this information has different spellings in different places, but the salient fact was the young princess was eleven and judging from the carving above, her mother was heartbroken. An alcove with a doorway that reflects the sunny yellow exterior color. Dave and I play dueling cameras. 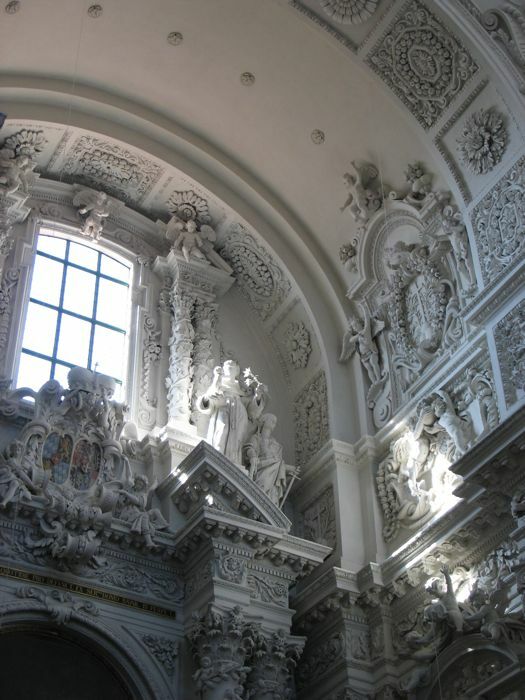 When the sun would strike directly on the stucco decorations, the contrast between the shadows and the brilliant light was startling. The dome, with its yellow highlights, fascinates. I suppose this is a confessional. I loved the contrast of the warm wood against the stark white. The yellow from outside leaks in and casts a golden hue. I assume it’s a reflection off the exterior color. One of my favorite shots. It’s as if the putti is saying hello (good-bye?) from its place on high. Monday we begin a wild-goose chase for some wood carvings. All I’ll say about that is we had a nice bus ride in the middle of the day which brought us to the Deutsches Museum, Munich’s equivalent of the Exploratorium and Smithsonian’s Science and Industry Museums mashed together. The guidebook says it’s the largest museum of its kind in the world. It IS big. 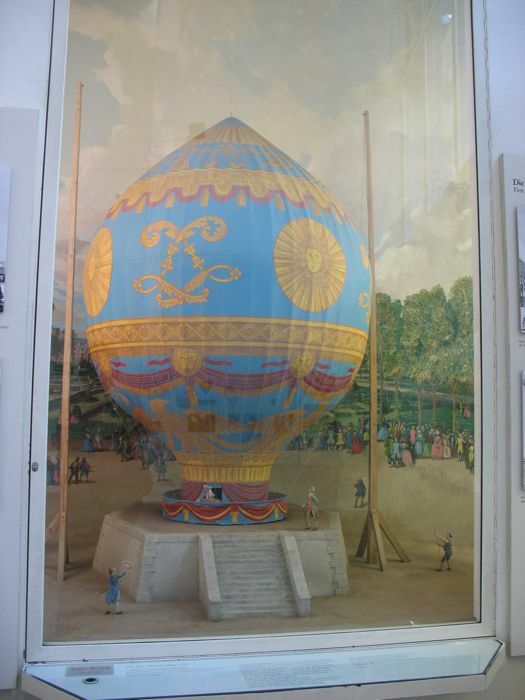 The main hall is filled with an exhibit about flying, beginning with this model of a hot air balloon. There was an exhibit on how to fly a plane, so Dave and I took our turns at this jetliner. It’s way tougher than it seems. Really this swirling aqua mass was inside the Pharmaceuticals Exhibit which shows a human cell model which is magnified 350, 000 times. That purple eyeball is really the nucleus. Dave explained it all to me, as the Biology class I had was also erased from my memory banks some time ago. And I’m standing near the Golgi Bodies. I wanted to photograph the mitochondria and hang the resultant photograph in my study because they’re the energy powerhouses of the cell and I’m in desperate need of more. 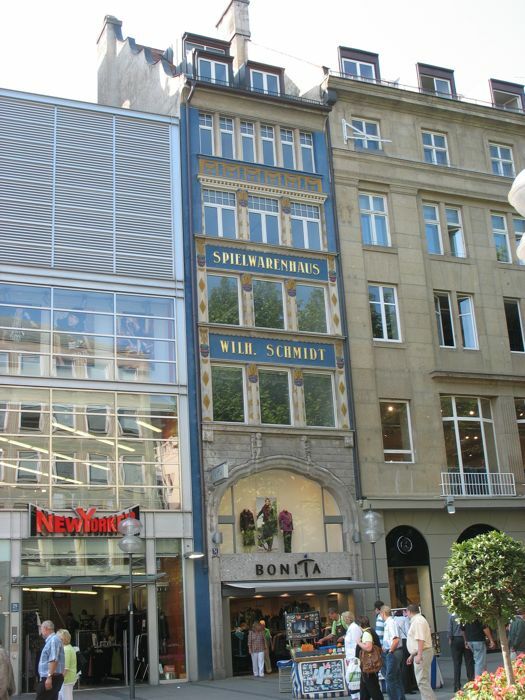 Bayer Aspirin began here in Germany, and the museum has an old pharmacy taken from an early monastery. Click here to go the museum website for a panoramic view. Incidentally, the Chicago Museum of Science and Industry was modeled on the Deutsches Museum. 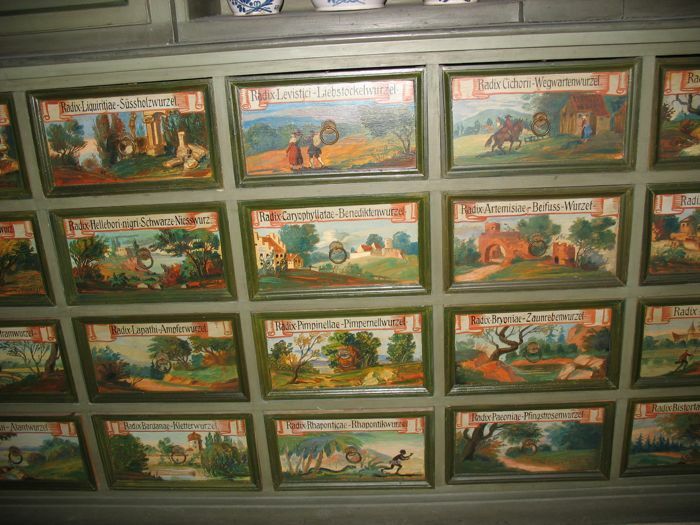 Drawers in the old pharmacy. Since it was now getting later and later in the afternoon (the clock shows 3:10), I’m thinking LUNCH, but where to find it? We decide to head back up to our neighborhood. Later on we found out that the yellow building is an Art Nouveau bathing temple. To get in the mood, the dude on the rocks in the middle of the river is sunbathing in his birthday suit. Dave didn’t believe me at first (I’d read about this Munich experience somewhere), but as we walked up the street to the right of this scene, it was confirmed. There were a few others that you can’t see, behind the bushes. Where we ate last night, at the HofbrauKeller. About that point, I was pretty much ready to eat the stoplights, the trees, anything. So Dave wisely found usa small place to grab a bit to eat. We had green salads, drinks and a pretzel. A Bavarian pretzel. The view across the street (Wienerplatz). We walk home, noticing this small church (below) in this area of Munich named Haidhausen. We walk past the Klinikum, a hospital, where Dave’s conference is held. At least I think this building is part of that enterprise. Then, home to our hotel. Later that night we went over to the Opening Reception, tucked in the back of the Klinikum. It’s a bit odd to walk past people in wheelchairs and with casts and bandages on your way to a nice party. Most people were there already and had found their tall glasses of Munich beer. They served us little open face sandwiches of all varieties, fruit salad, turkey and pineapple skewers and any number of warm drinks (they don’t really believe in ice here and instead chill the drinks first–which sometimes works). We decided against the water-with-gas and went for the apple juice. It’s less sweet here in Germany. We’d decided earlier that if the refreshments were half-decent, we’d count that for dinner and just come home afterwards. That’s what we did. See earlier post for more information. Dave and I breakfast together, then he leaves and I linger over the paper and posting our travels on the blog. I do the tourist laundry thing (rinsing out underwear in the sink, rolling it up in the towels, snapping out the moisture and hanging it over hangers in the closet so the maid won’t see) and get going mid-morning. I head towards Marienplatz, the center of pedestrian Munich, or should I say, Tourist Munich, stopping at Thomas Sabo’s charm shop for an addition to my charm bracelet. They wrapped these charms in miniature round hat boxes. Charming. I walked on. I like seeing the unusual, and in this case, two little shadow box pictures in a window bordering a small park named Marienhof Park. Just like we are so “American,” they feel so “European,” especially in their graphic arts. 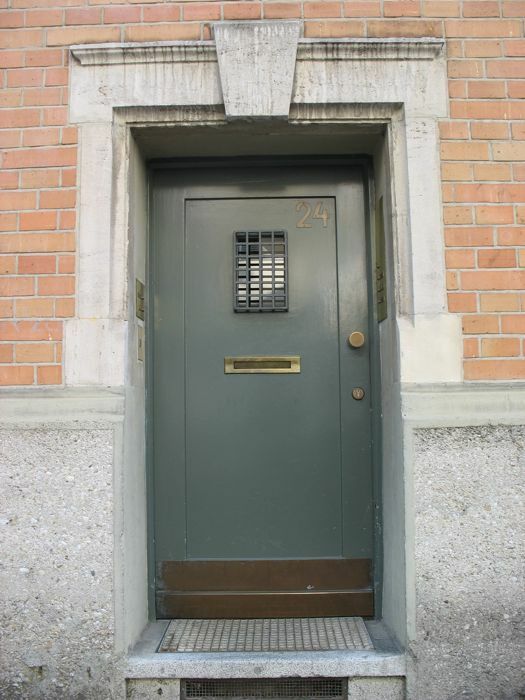 Just around the corner was a long yellow building with many doorways: Dallmayr’s Food Shop. It was vast, huge, fascinating and I didn’t feel like I could take any pictures inside, but did purchase a sel de limon and curry powder, mainly because I loved the containers. 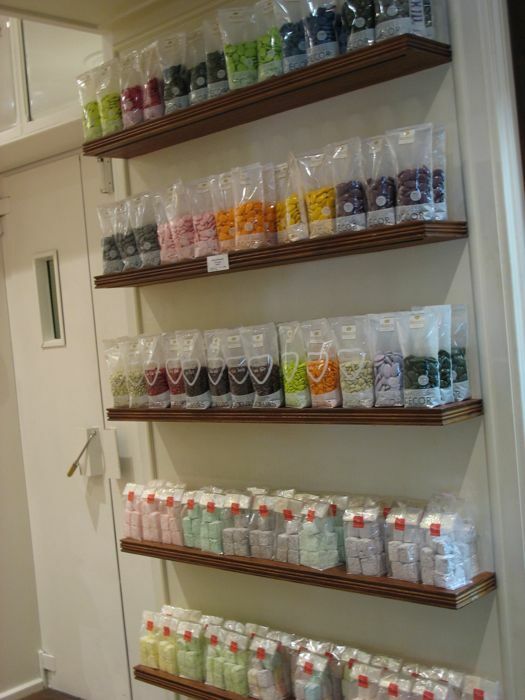 Well, maybe I was influenced by this window showing piles of different flavors of salts. Sorry about the glare on the windows. How can I resist a truck with this word on the side? My destination was this shop: Deeply Felt, a little place that sells only felt. It was loaded with felt, and a teensy little area where the customers stood–it might have held 3 or 4, and there was one in there already. I tried to hurry as I chose 100% wool felt–a rare item in the U.S.
Down from that was this umbrella shop. My big impulse buy was an umbrella in sunny blue with scenes of Munich all around. I mentioned to the shop owner how nice it was to have such sun. Not for me, he said. I like rain. 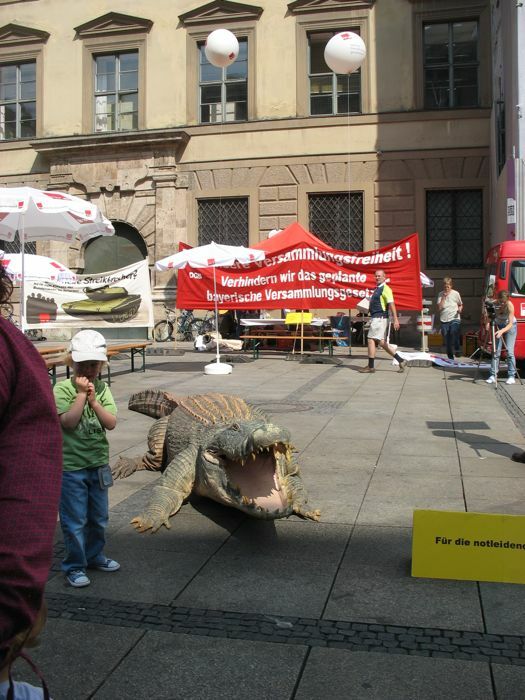 If you happen to be in Marienplatz at the right time you are in for an amazing treat. The square will fill with the sound of the carillon in the Glockenspiel. It plays twice or three times a day, at 10:30am, noon, and 5pm. As the folk music chimes ring out, doors open and brightly hued mechanical figures of enameled copper emerge and begin to dance. 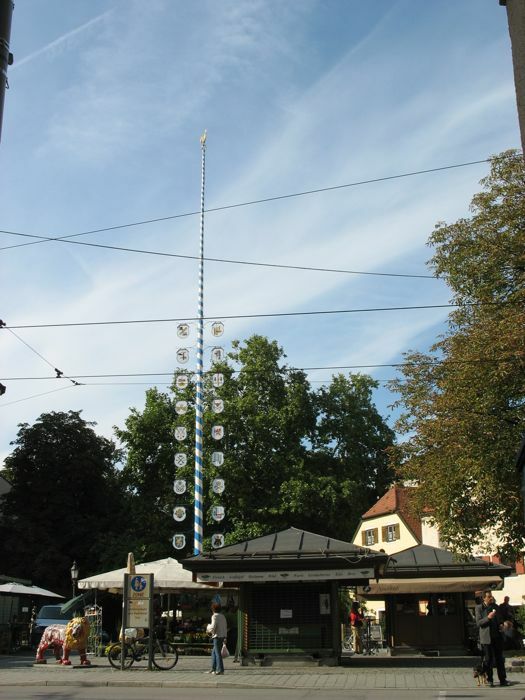 The Glockenspiel has two separate acts which celebrate two events from Munich’s past. The colorful dancers are doing the Schaefflertanz or Dance of the Coppers which commemorates the end of the plague in 1517. The other “act” is a miniature tournament of knights jousting. They are reenacting a famous tournament that was held for the royal weddings that took place in Marienplatz in 1568. Dave and I remembered it from our last trip, and so made a beeline for it this time as well. I watched the Golockenspiel play, then headed for the elevator to take me up to the top. Blessings for elevators. It was a lovely day, warm and pleasant, with good views around Munich. This is the Frauenkirche, the largest Gothic basilica in southern Germany; it was built in record time (1468-88). View from the top of the Bavarian Motor Works (BMW) Building and Olympic Park tower. They had these glass plates for the key to what we were seeing. My favorite church, as seen from the tower. There were quite a few people up there with me, and I happened to ask one man how to say the German word for Excuse Me. My journal has only the phonetical pronunciation of “Fat-Sigh-On.” I complimented him on his English, and asked him where he learned it. In Germany, he explained, if you are a good student you are encouraged to travel your senior year of high school on a fully paid study abroad. He ended up in North Carolina, but his English had no trace of an accent. I later used this example in a debate back in my classroom in California, where they had to develop an argument. Interestingly enough, more of my students thought the school system should NOT sponsor a student abroad, than should. Many of them are from small towns and perhaps have never left the area. This is a view of the Old Town Hall (on the left with the crenelated facade), an old gate (red steepled roof next to it), and just behind that with the red roof and the green-topped tower is the Heiliggeistkirche, also known as The Church of the Holy Ghost. Looking down into the courtyard. I ate lunch underneath one of those green umbrellas: weissewurst, or white sausage, a Bavarian specialty, most typically eaten for breakfast. I signed the tethered-by-a-chain book on the way out, in the lower right corner of the verso (or left-facing) page. Notice the dog-eared corner on the upper right. I did that so I could show Dave when we came back. But when we returned later that week, the book had been replaced by a fresh clean copy. I think it always pays to read up on a place before you go. 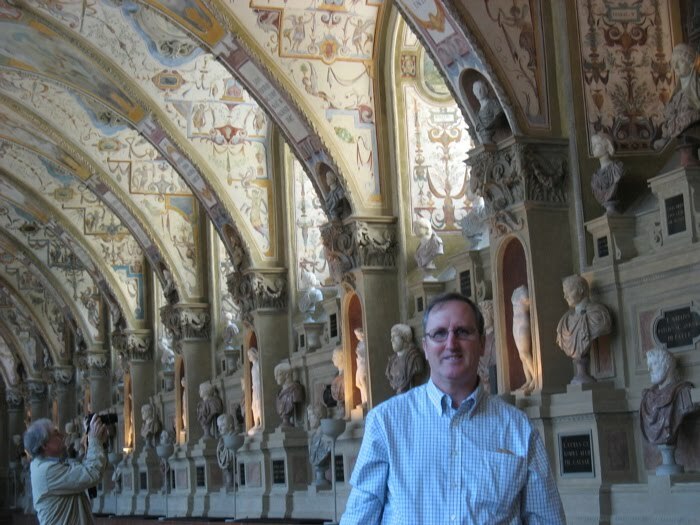 One tourist had written about the inside of the Rathaus and had a few pictures. When I was leaving the tower, I asked the lady taking money if I could walk through the town hall. Yah, yah, she said, and indicated I should go right when leaving, instead of left to the elevator. I went down the corridor (see Friday’s post for the huge red door), and felt like a bit nervous trying to figure out which door would lead me to where I wanted to go. Down some steps, turn and wow. That nameless tourist was right about this. The stone arches, and very gothic styling made it feel like I was inside a foreign castle of some kind. While in the war Munich was bombed, yet apparently the damage to the Rathaus was minimal (it housed the US Military Headquarters after WWII). I do believe some of it must have been reconstructed, for many of the windows have a newer date on them than the date of construction of the building. The whole place was fairly deserted. If someone did show up, I tried to look like I knew what I was doing. Everything was so. . . so. . . Germanly Gothic. Until I stumbled into the above alcove. . .
. . .and saw these windows with an American flag, and the Statue of Liberty. I began to pay attention a little more. Figures of Edison, Lincoln and Andrew Carnegie along with a depiction of Niagra Falls. 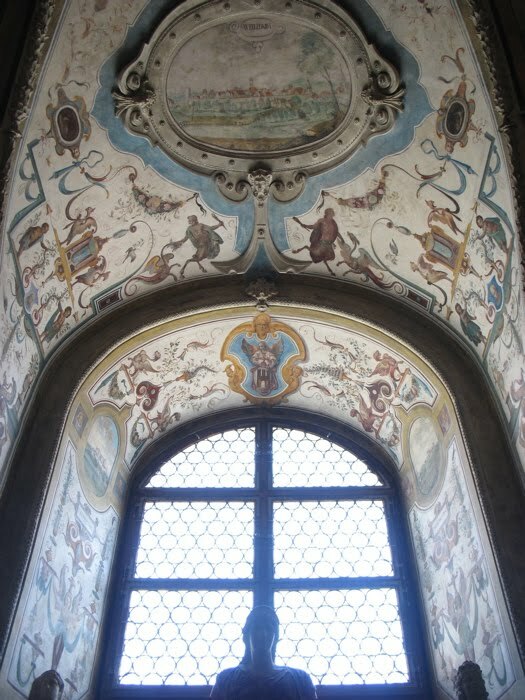 The windows throughout all had early creation dates, some with rondels of old glass. Maybe they salvaged some from damaged windows and re-set them into new glass? But why so many American-themed windows in the alcove? If I read German, I might be able to tell you. But many times as visitors to another country, we see things we don’t understand and try to figure out plausible solutions and answers to our questions. I remember going to dinner with Matthew and one of his friends to a Chinese restaurant. She took the chicken bones out of her chicken soup and lay them on the table, saying, “This is how the Chinese do this.” I had been to China, felt like I was okay-immersed in some of the day-to-day manners and I’d never seen it. I replied, “Maybe where you were, they did this.” I thought at the time how large of a county America was and how our manners and customs vary from region to region, and China was even larger still. And with a language that felt impenetrable, so I couldn’t ask enough questions nor get enough answers for all that I saw. I tried to figure out some things, but didn’t venture into the Chinese subway, fearing I’d be transported to Siberia or something. 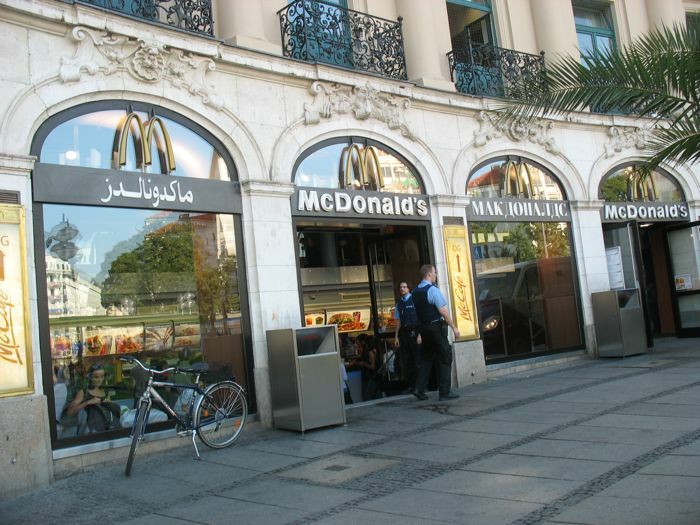 I walked a lot and had a lot of questions about what I saw, both then, and now, in Germany. I still have no answers. I took as many photos as I dared, but it was so quiet in there and I, with all my crackling shopping bags, felt very noisy. I proceeded on my tour. A more traditional window was on the next floor. Notice the diamond-like blue and white pattern on the shield of this wooden horseman. That’s the Bavarian pattern, and was found on mugs and ribbons, and dresses, and store banners–everywhere as we were close to Oktoberfest, and everything was getting pretty dolled up for the occasion. Aside from our stars and stripes, I can’t think of many patterns that are pervasive to any particular region of America, but then we are a much newer country, with less history and tradition than these folks. Now I feeling like I’d overstayed my welcome, plus I was getting a little bit hungry. So I went outside, and enjoyed lunch (see Menu from Munich for more details on that), and while waiting for my meal, took the following picture, looking back up at the tower. I write my postcards to family back home, and then remember that I need to buy stamps. Add that to the list of Tourist Things To Do today. One thing for sure was that I missed the tram rides. Our side of Munich relies heavily on the trams and that’s how I had traveled before when we were here. One item was to try and find that gate that had inspired the center medallion of a quilt I made after returning from Germany last time, but it was always right there, at the end of the block of a tram stop and I thought I might never find my way. I walked through the old gate at the end of Marienplatz, and entered the church at the corner, the Heiliggeistkirche, or Holy Ghost Church. It had a soaring center nave, flanked by two equally high side areas (I guess that they are all the “nave.” What do I know?) I’d have to say the predominant coloration is pink cotton candy meets the Tiffany box, and they are both adorned in gilt. The church began in 1208 as a pilgrim house, but within 50 years it was being used as a hospital. 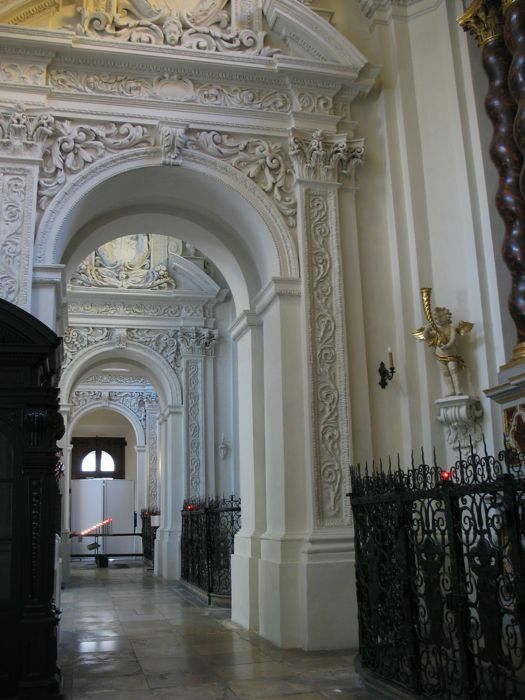 The church itself was constructed in the 1320s and four hundred years later it was re-made into a baroque church, the interiors by the Asam brothers, famous in these parts for their use of lots and lots and lots of rococo flourishes and gilding. Yep. So what entranced me was the plain wooden pulpit on the side, conspicuous in its simplicity. This spoke of the church’s origins. booths of food, floral decorations, beer, cheeses. No lebkuchen cookies like last time. Walking on, I rounded a corner and saw this. No, it wasn’t the gate from before, but it was the exact same pattern in the center of my quilt. It felt like a mini-homecoming–something very familiar. I also found the shop where I’d bought my dirndl fabric, and bought one more meter to make a Christmas apron. Then around another corner, saw a building so old, it had the date painted on the outside. 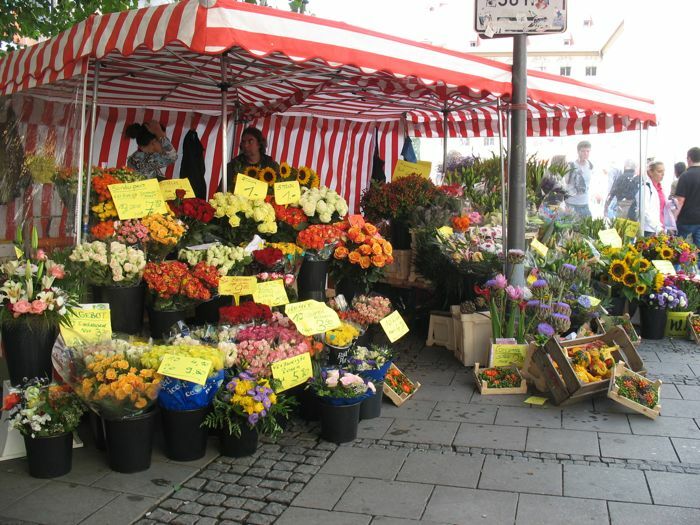 I had purchased an apple while in the Viktualien Markt and munched on that, the wandering wearing on me. It was getting late and I had a headache and was far far from the hotel. I remember reading in one account that someone believed the best was to do sightseeing was to wander until exhaustion, stop to eat, then repeat. Well, I’d done the first part well, but I still had to find the stamps, so after buying a bunch of souvenir chocolate at the Gallerie, I asked their concierge (how interesting is that?) where to go. He directed me. I stood in a short line at the Post Office waiting for a clerk, watching the two women in front of me. One was holding a small tiny baby that couldn’t have been more than 2 or 3 weeks old and the other woman was in charge of the stroller, leaning over often to touch her friend’s baby. I heard a chime. My turn and I went to station #2. I pointed to the addresses and luckily the man spoke enough English to help me. I paid for what I needed and then he pulled out his book of stamps, then asked me if I had any glue. He pulled a glue stick out of his drawer, applied it to the backs of the stamps, pasted them on to my postcards, nodded, and gestured to the people behind me to come forward. So, I guess they don’t have glue on the backs of their stamps. I retraced my steps, head still hurting, apple gone, bags getting heavy and remembered that I wanted to buy some earrings for a friend back home. I jostled for control of the turn-about earring stand with some teeny-bopper, losing, then finally choosing a pair. I wandered back to the U-bahn, grabbed the 100 bus, arrived home and fell asleep. Dinner was at Kafer, the fancy food shop, which also had a nice restaurant on the side of the store, as well as very pricey restaurant on the second floor. We enjoyed the patio-style restaurant, obviously. They had a deadline of closing by 8 p.m. and they were serious about that, taking down the posts, rolling up the overhead canvas and stowing the cushions as we finished our dessert of fresh raspberry tart. After dinner we walked around the neighborhoods, got money out of an ATM, then went back to the hotel. Dave worked–writing to one of his former grad students about publishing their work, a corollary which had been discussed that day, and I did more tourist laundry, finishing out the day the way I’d started it. Look closely at this decorated May Pole, and instead of townspeople, merchants and animals, you see doctors, nurses and hospital beds. This is in the courtyard of the Klinikum, where we all met for our outing to Starnberger See, a lake near Munich. We bunched up into groups of 6, received a Metro ticket from Patricia and Isabel (the conference’s chief Go-To Organizers) and were off en masse to the S-bahn, via the U-bahn (the train systems) to the Starberger See, about 45 minutes or so outside of Munich. 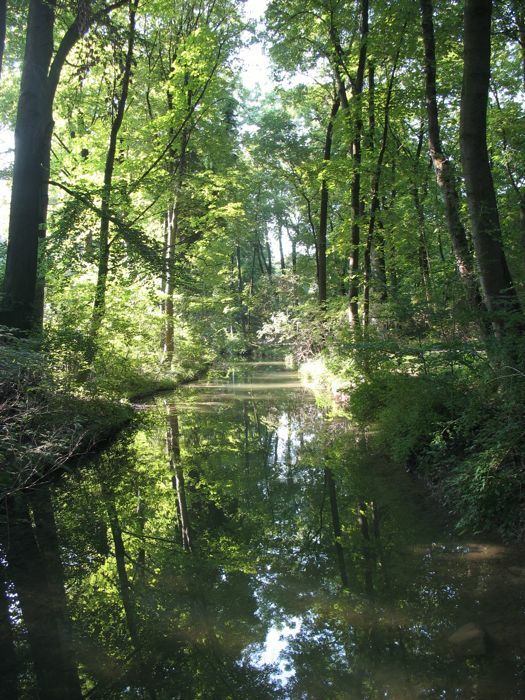 This was the place where lots of early nobles built their summer homes, and now, lots of noble scientists were going to go on a lake cruise for a few hours. Dave shows us the sign. We arrived a bit early, so we walked up and down the waterfront. I liked the boathouses, in their shabby, painted finery. Drinks were free on the boat, so the bar was immediately enveloped in a crush as tall glasses of Munich’s finest beers were poured. I waited for a while, got a ginger ale, planted myself on the lower deck (away from the crowds upstairs in the warming sun) and wrote in my journal, while watching the scenery and talking with Patricia and Isabel, the women who keep the conference machinery well-lubricated and running. Sailboats running in some sort of regatta. 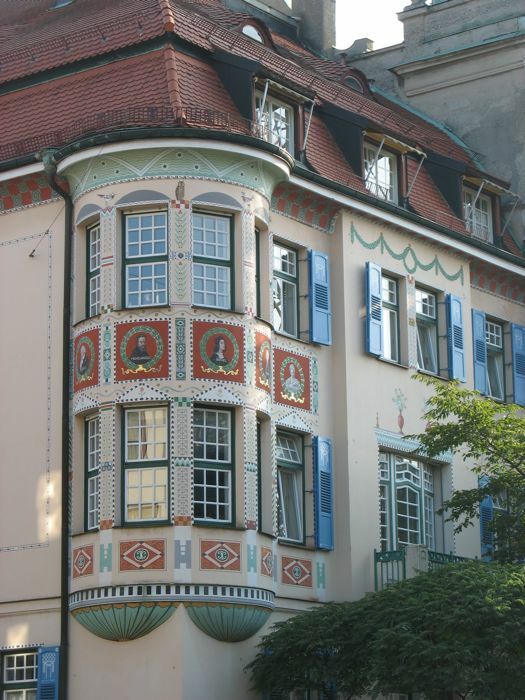 These Bavarian-style houses dotted the shores, interspersed with thick green forests. Oktoberfest was right around the corner, the weather was warm for September, and the cold had not yet arrived to start the leaves turning colors. Everyone was in a good mood. At the southern tip of the 13-mile long lake is the town of Seeshaupt, complete with teenagers who like to moon tourist cruise boats (click to enlarge). No, I didn’t realize this was what they were doing until later that night when I loaded up the photos into Dave’s computer and burst out laughing. I apparently have some relatives who are fond of mooning others–I wonder if they’ve also been captured on film by unsuspecting tourists. Looking out past the end of the boat, the Alps are a fuzzy blue ridge. Apparently on some days, they are seen clearly. On the eastern shore lies Schloss Ammerland, built in the late 1600s by King Ludwig I was bequeathed to a Franz von Pocci, a musician, author and poet. Good deal for a poet. Patricia, in the visor, is originally from America, but married a German and has lived her most of her adult life. Patricia was the main organizer in the past, but has now turned the reins over to Isabel (in the foreground). They are very interesting women, and I asked them many questions about what I had seen while in Munich. Given my fascination with the dirndl, I asked them if they had dirndls. Oh no, they said, they are very expensive. Most women do not have them. I told them I had three. Three?!? I made them all, I said, and they are in three different sizes, dependent upon when I’d gotten the fabric. The first one I made was from fabric brought to me by my sister Susan and her husband Tom when they were on a study-abroad program when they were young marrieds. This was taken in 1988, obviously Halloween. When I made that one, I called up a return missionary from Germany who lived in our ward and asked him for translation. I remember him struggling over the word for “bias binding,” which was probably not in the missionary discussions. The second one I made after my honeymoon in Austria with Dave. I looked, and I don’t have one of me standing up, so this will have to do. The Austrian women in Salzburg wore theirs with a scarf that they tucked in the sides of the bodice. I now wear the scarf loosely tied. The third one I made while in Washington, DC, upon returning home from Munich in Fall 2004. I struggled and struggled with the pattern directions which were all in German. If only I’d looked in our Burda pattern books here in the States, I would have found one in English. But it was done then. As we approached Starnberg and the end of our 3-hour cruise, the sailboats unfurled their spinnaker sails, making for a colorful display. The scientists had a chance to talk their science, settle questions, re-affirm friendships. Dave takes time with a colleague. One last sight on shore: the commemorative cross for King Ludwig II. One evening, he went for a walk with his physician but later, both were found dead, floating in the water. The physician had scratches on his face, and the mystery was never solved. Every year fans of this king meet here on the anniversary of his death. Ludwig himself said: “I wish to remain an everlasting mystery to myself and to others,” and apparently he has succeeded. We land and walk around the lake to our restaurant. Yep. This way to Undosa Restaurant. Translation: All You Can Eat Cholesterol, but Very Delicious! This table was first, with a variety of salads, and pickled vegetables, and a big bowl of fresh green lettuce, and some other very tasty things that you will lead you to think about diets when you go home from Munich. Close-up of the radishes. They were enormous, crispy and not to spicy. Very good. The item in the lower right is some sort of small, thinly sliced bologna item–I’m sure it’s a wurst derivative, and the yellow dish was potato salad like you’ve never tasted before–very good. In between the salad and the next course were these little glasses filled with gelatin-ified chunks of meat and sausage. This was the item that most Americans passed over, but that the Japanese tried. This meat tray took two people to carry it in. Mustards and sauces in the front, radishes in the back, sausage and etc. in the middle. Quite a spread. This was the fish course with salmon, smoked chunks of fish standing on cucumbers with tomatoes for hats, smoked fish in the center underneath the pineapple, and all decorated with citrus slices and some sort of dry white fish. The layout and the variety and the amounts were stunning. This board must have been 3 to 4 feet long by about a foot-and-a-half to two feet wide. Free drinks! If you’d read my other posts, where I mention the cost of beverages in Munich, you can understand my excitement to get my bubbly apple juice for free. This was very good. We had these giant pretzels–I think they call them bretzels–and chunks of brown bread for our bread plate. I LOVE those pretzels and had them as much as possible while in Munich. So at this point, we are saying Uncle Uncle Uncle!! but keep eating because this course is the amazing combo of a semmelknodel and a kartoffelknodel and roast potatoes and slow-roasted pork and amazing red cabbage kraut, but if I could have wrapped it up in tin foil to go, I would have. Patricia and Isabel had ordered a traditional Bavarian feast for us, and the quality of the food was topnotch. We weren’t done though. There was this–a Bavarian Cream with red currant jelly and red currant garnish. I’ve never tasted anything so creamy and amazing–perhaps it’s the German version of a Creme Brule, but more amazing. (Did I already say amazing?) The serving size and the serving spoon were both miniaturized, for good reason, because there was more. 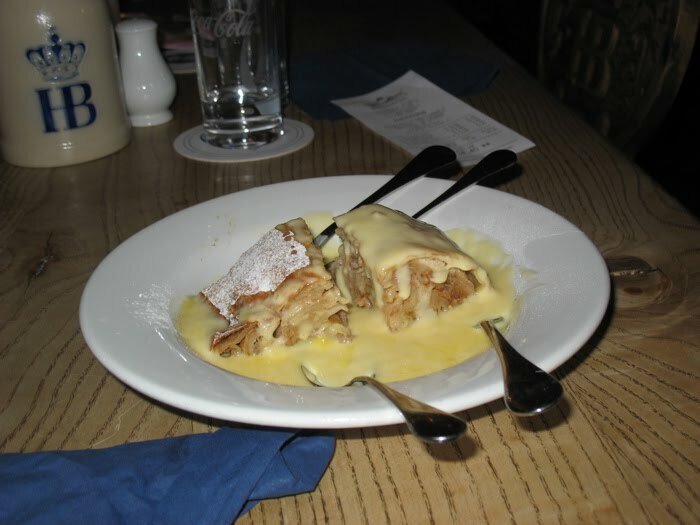 Apple strudel with vanilla sauce and a dessert kind of like a cinnamony saucy cut up bunch of pancakes. What a repast! but we had to skip the last course of cheeses because we had to catch the train back to Munich. So, regretfully we left this amazing dinner (many thanks to Isabel and Patricia) and made it to the train with 3 minutes to spare. We probably should have walked home to Munich to walk off this meal, but it remains a delightful memory. I awake to hear Dave practicing his talk in the bathroom–we’re all up early today. He’s off by 7:30 a.m. and I see him at breakfast just as he’s leaving to go and load his presentation. I hurry and eat and then I’m out by 8:10–probably the earliest yet. That’s how it is on the last days of a trip–it’s rush rush to try and cram the sightseeing in. I take the Bus 100 (I will be REALLY glad when they finish the streetcars, but then again, it doesn’t matter because I won’t be here) to the subway stop Odeonplatz. Then catch the U3/U6 train to Karlsplatz, get off and grab the streetcar/tram 27 (Peturing–the trams are working up here) to Elizabethplatz. I want to see my namesake plaza. Okay. Disappointment. 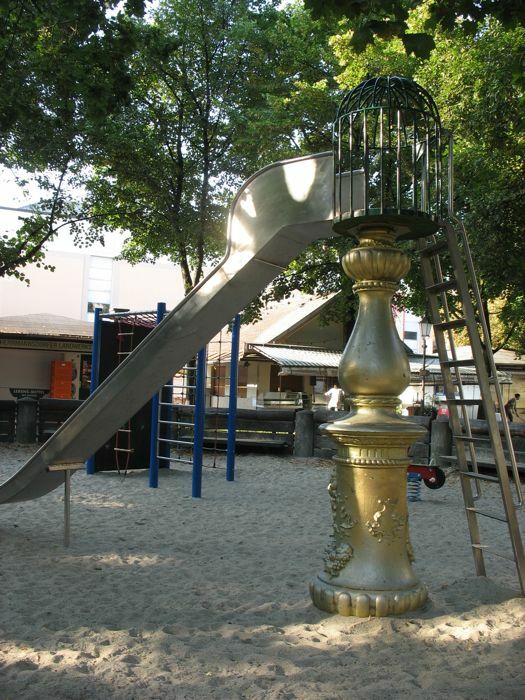 I see this lovely golden painted slide, a tiny playground, a teensy market where nothing is open. That was a bust. 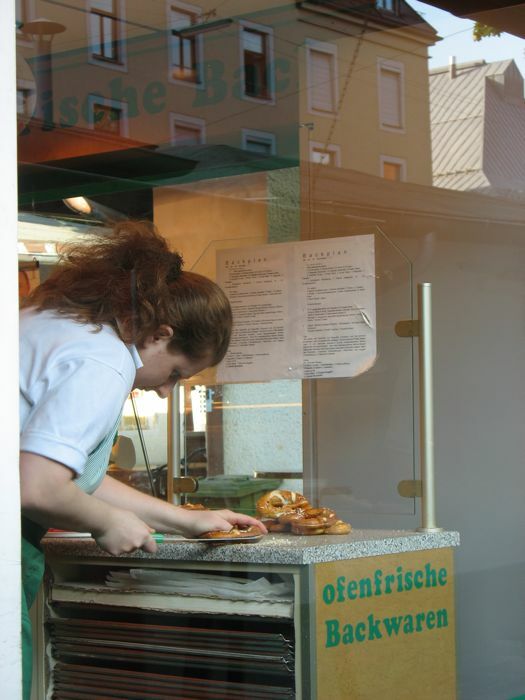 This young woman is getting ready for the day by slicing open the bretzels. She’ll butter them, then put them back together and sell them for a snack. Time to move on down the street. I think I’d like to head over to the Siegestor next, whatever it is. This is on the next corner. 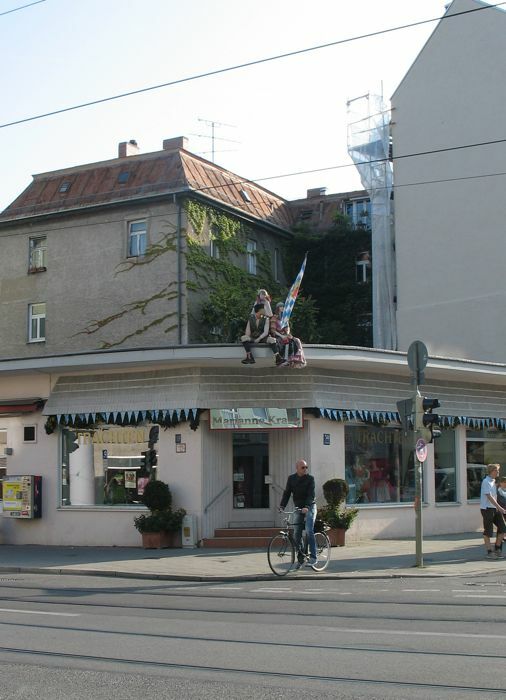 Yes, it’s a shop that sells dirndls and traditional clothing, but they have mannequins atop the roof, as an advertisement. It’s interesting to walk down the streets here, as the buildings look so different to me. 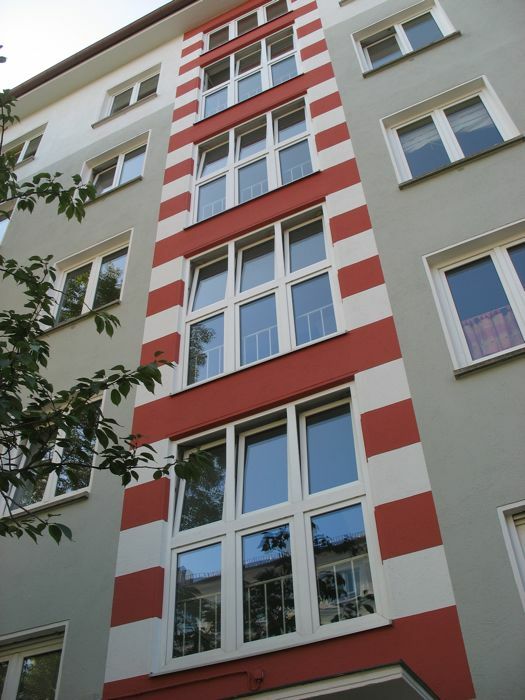 I like the paint colors, the patterns, and the unique little touches that make this place so Munich-y, if there is such a word. This doorway belongs to the building just above it. Like any tourist, I snap a few photos of the doorways. 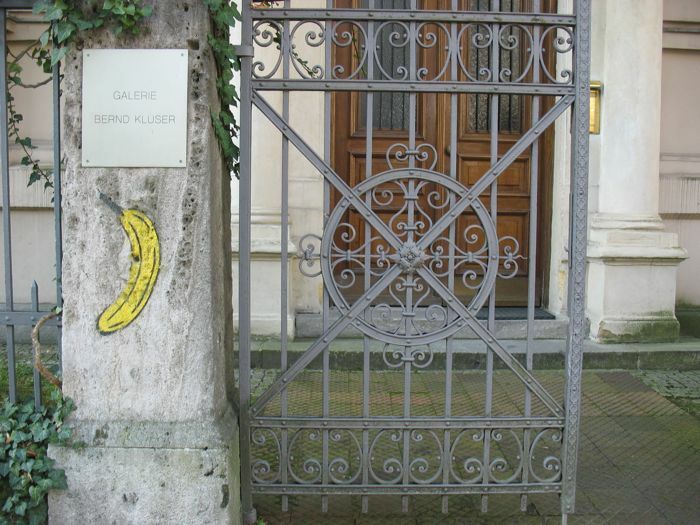 The decor just makes this one–elegant door, elegant gate, banana. 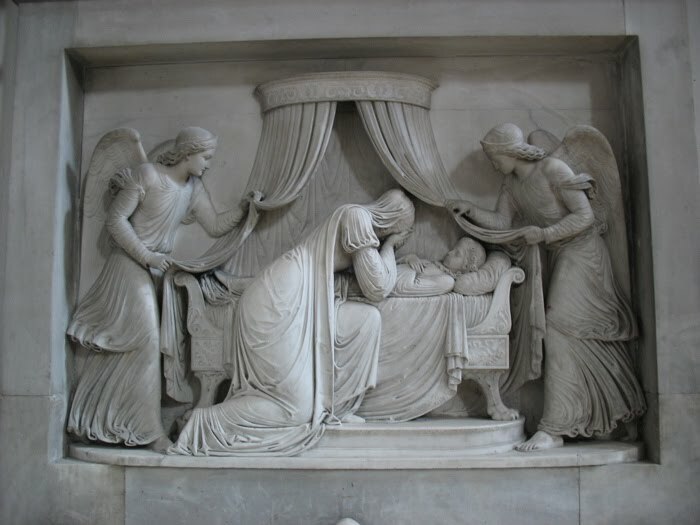 . .
Beautiful plasterwork of a mother and a child. If my crude reading of the sign on the gate outside says anything, this is a clinic for mothers. So, I see the gate, which I think is one of the gates of the city. It’s not. 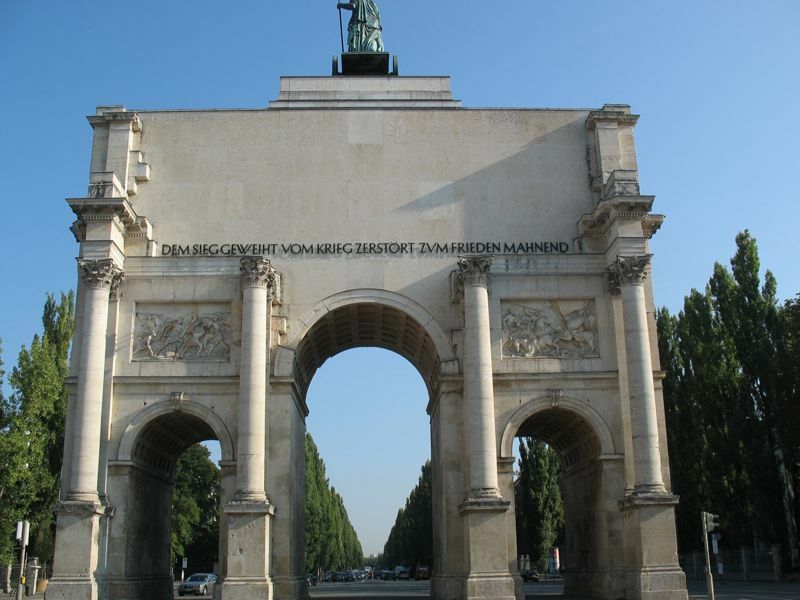 It’s the Siegestor, or Victory Gate. 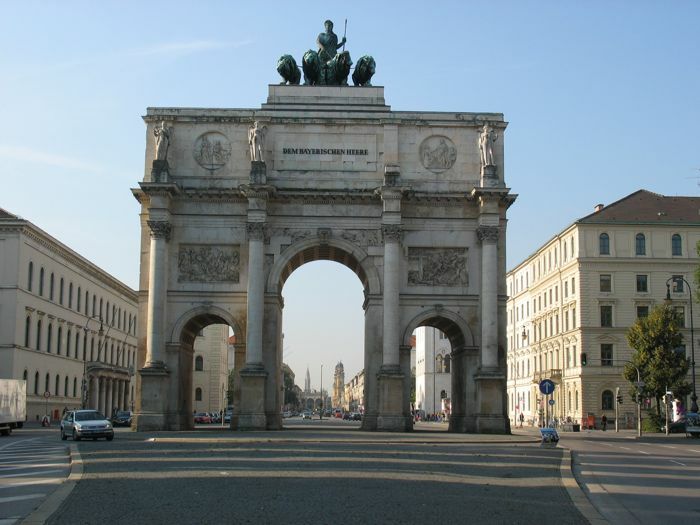 According to Wikipedia: it is a “three-arched triumphal arch crowned with a statue of Bavaria with a lion-quadriga.” Okay. Then it dawns on my that I can see my favorite yellow church through the arch, and all of a sudden, I have my bearings. The arch is in the middle of the street, so I dodge the traffic over to take a look at it. 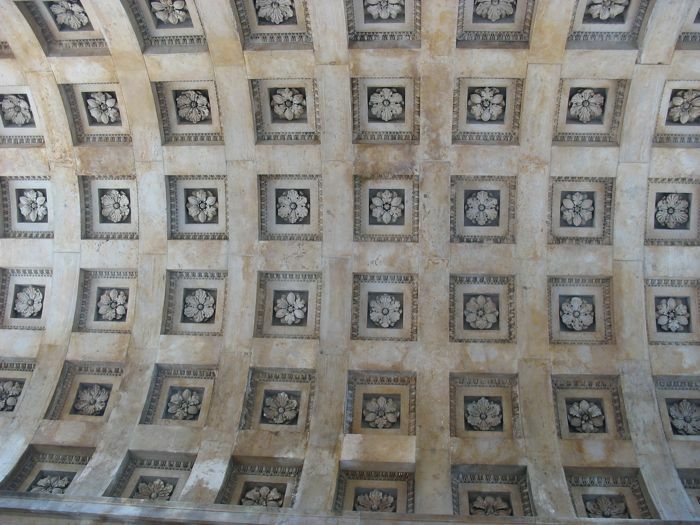 Looking up into the arch, with its coffered ceiling. Requisite carving of someone getting creamed in battle. It’s quiet, and I’m the only one there. It’s the symmetry and balance of this door–I’m sure it’s a type of architecture style that is quite well known, just not by me. 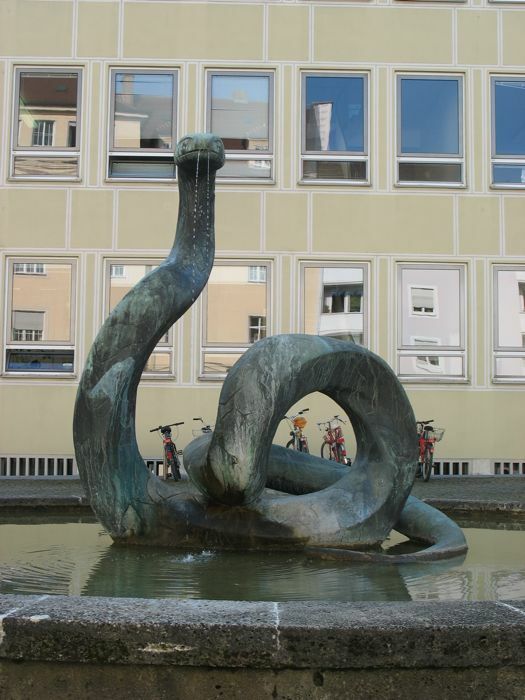 Snake Fountain in front of the optometry school. 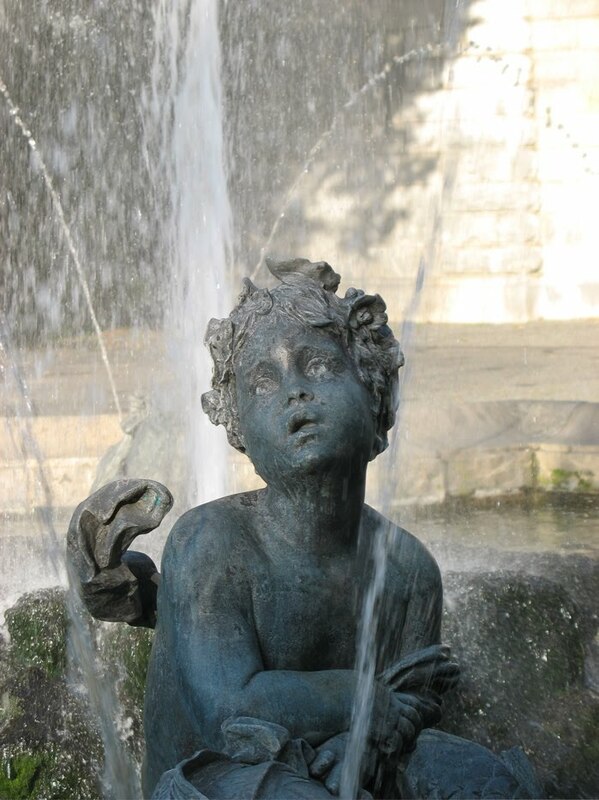 Add this to the category of Fountains That Squirt Something. Just before I entered the Englischer Garten (English Garden) was this lovely half-round building, with elegant plaster medallions. 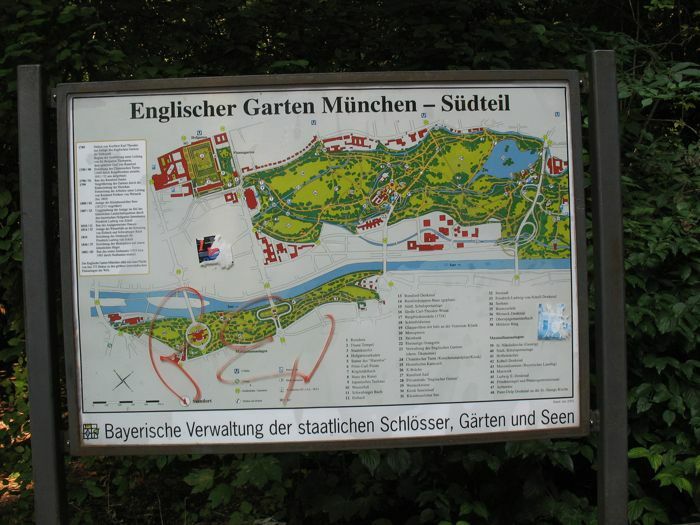 The English Garden is a large park in Munich, larger than New York’s Central Park. The name comes from the type of garden that it is: an English garden, with informal landscaping. It’s an oasis in the city, but popular. 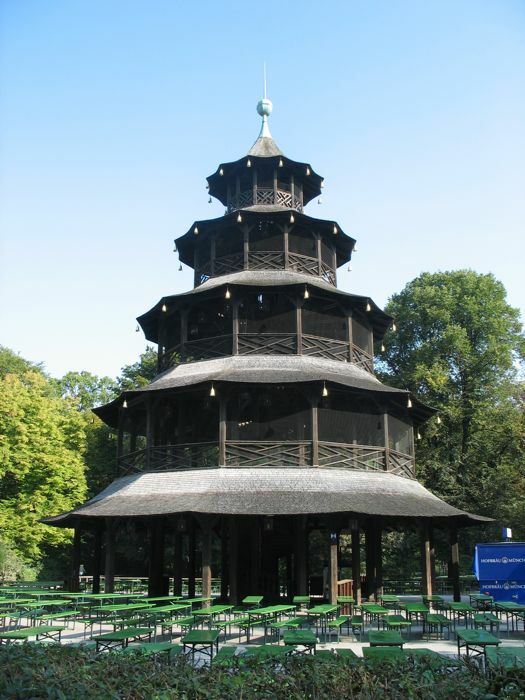 I made my way, via my tourist maps and an occasional posted map, to this: The Chiniesischer Turm, or Chinese Tower. The staff was cleaning up from the night before, obviously, and I liked the approach: squeegee mops on the tables. At the base of the Chinese Tower is a huge beer garden that seats 7,000–Munich’s second largest. I guess the largest is the Oktoberfest site. I hop back on Bus 54, hoping it goes somewhere close to a subway. I ask this lady for directions to the U-bahn, and they point me towards this tunnel. It goes like this “Ooo-bahn?” and a shrug of the shoulders, my finger on a map of the underground system. She gives me several sentences in German, nods her head and heads off. I follow and the tunnel leads to the station.So, Ubahn to Odeonsplatz and U4/U5 to Karlsplatz. As long as I don’t have to talk, I’ll can probably get there. Below, the tile work in the Karlsplatz station. 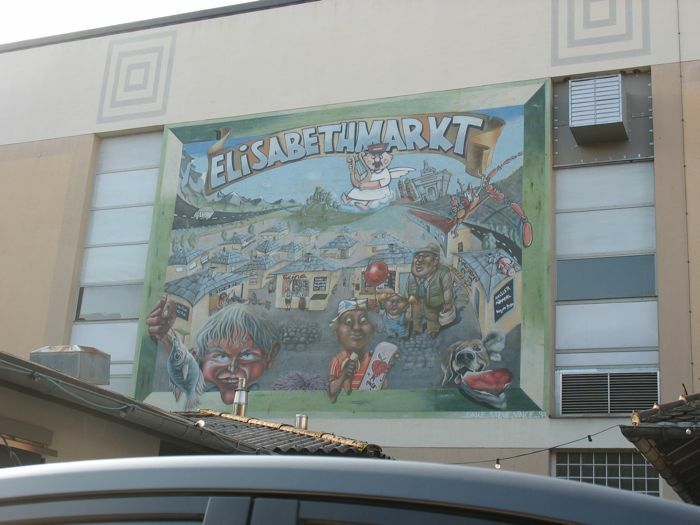 I was heading for a five-story toy store in the Karlsplatz area, but it turned out to only have two stories, and I couldn’t justify the cost of buying something for the grandchildren after factoring in the conversion rate of the euro to the dollar. I found the McDonald’s next door, with its Happy Meals. Unfortunately, it was packed. Through Karls Tor (Karls Gate–one of the existing gates of the city) again, up Neuhauser street, where I’m hoping to find lunch, see a few more sights. Oh let’s be real. 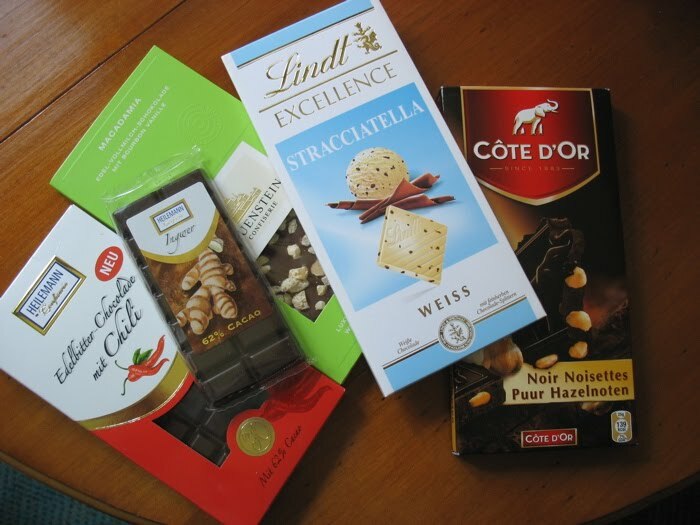 I want to buy more chocolate to bring home AND sight-see. 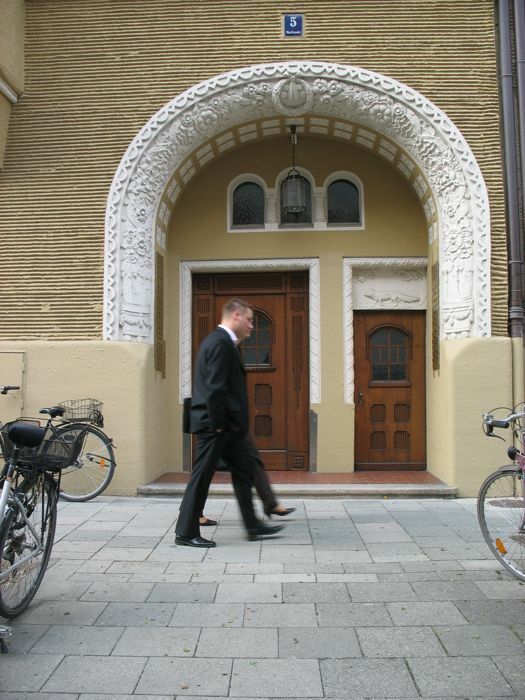 This is Burgersaalkirke, and you walk up from the street level to reach this. It feels like a worship space, although first constructed as Citizen’s Hall. Like just about everything else in this city, it was destroyed in the war (only the facade remained standing), and reconstructed. This street has no cars, only pedestrian traffic and in between all the more modern buildings, you can find little gems like this one. 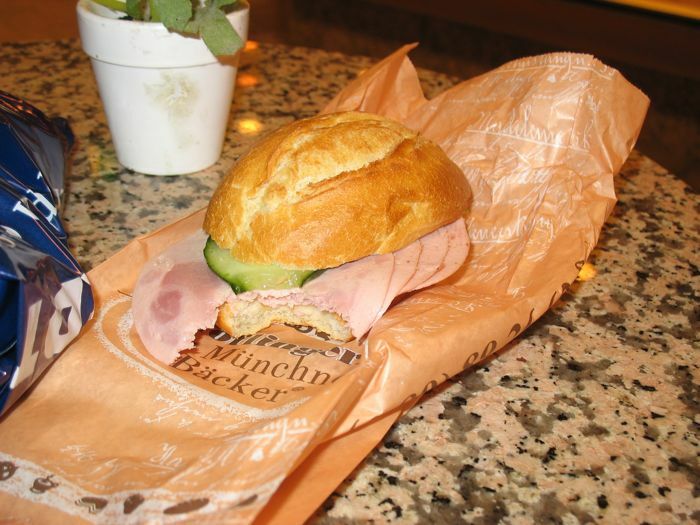 Lunch was basic–in the basement of Karstadt. But up one level is the chocolate area–a huge “room” full of nothing but chocolate. They take their chocolate seriously. A lovely tradition, I think. 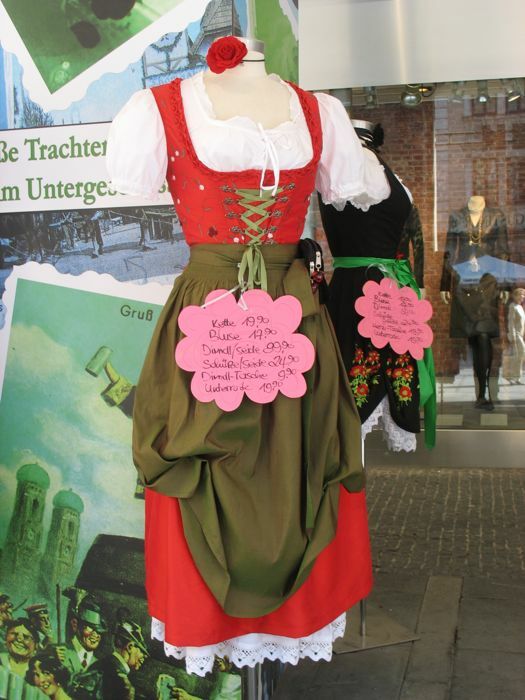 Up the street was this dirndl with all the parts labeled and priced. 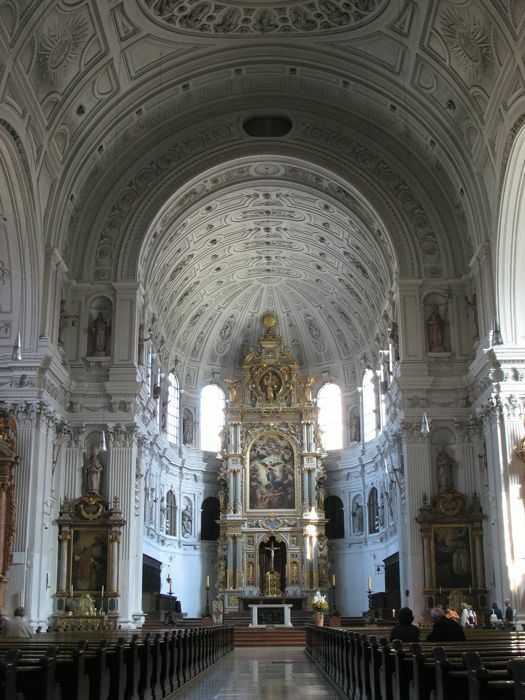 I’m determined to hit every church I can, for who knows when I’ll ever come back to Munich? This one is St. Michael’s. 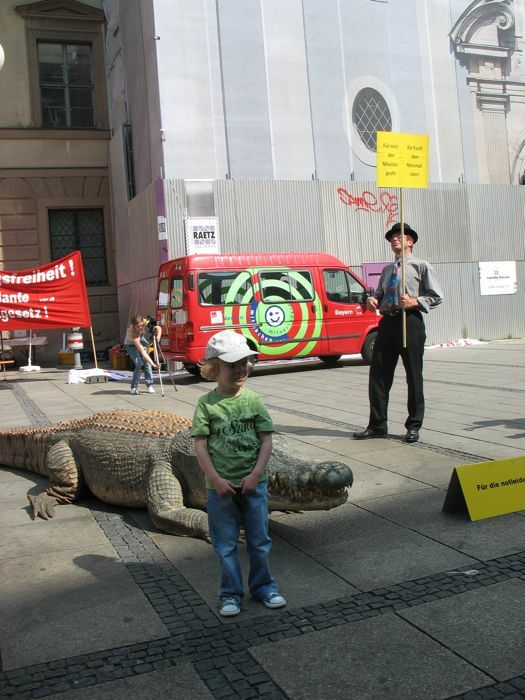 Outside was a political rally–where this young child bravely stood by the alligator that was crawline around. I think it was remote controlled, but it was frightening at first. “But you have Mr. Obama!” she said. I realized that her view of what our new President could do was so very different than what I thought he could do, given the constraints of a hostile political climate, the machinations of Congress, and generally how our system of laws was enacted. It was an eye-opener to hear her talk, and others like her, who would engage me on this subject. Everywhere I went it was so different than before. Previously everyone wanted to know what I thought of President Bush, and most Europeans that I had talked to in the past had their own (not positive) views about him. But now–every one seemed to be in sort of a congratulatory mood–you Americans pulled it off, they seemed to say. You elected Barack Obama. Because of this, I understood why he was awarded the Nobel Peace Prize. He had changed the “climate”–America’s bravura and seemingly macho approach to the world was now more reasonable. 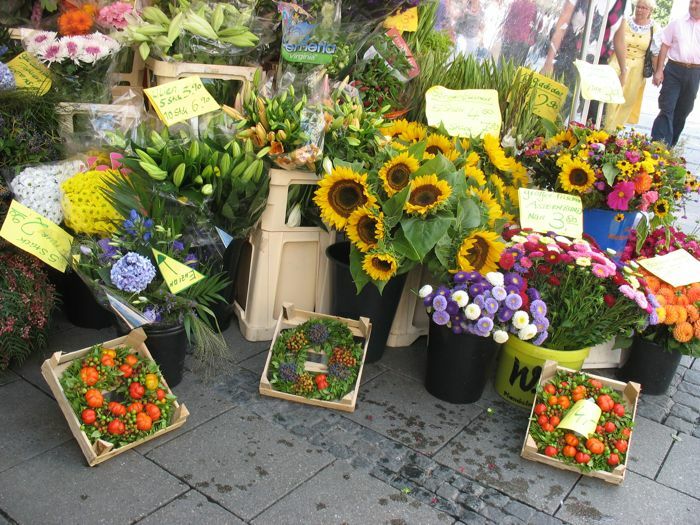 A flower stand in the street. I’m getting tired now, and am looking to head back to the hotel for a break. Down one street to see this lovely plasterwork facade, then a view (below) of the New Rathaus, elegant in the sunlight. I retrace my steps (U-bahn to bus to hotel) and take a much needed short nap–long enough to refresh me so I can head out for one last touristy thing this day: Bayerisches Nationalmuseum, or the Bavarian National Museum. I pay the entrance fee and they steer me downstairs to the Nativity Scenes and Creches. I take their hint. 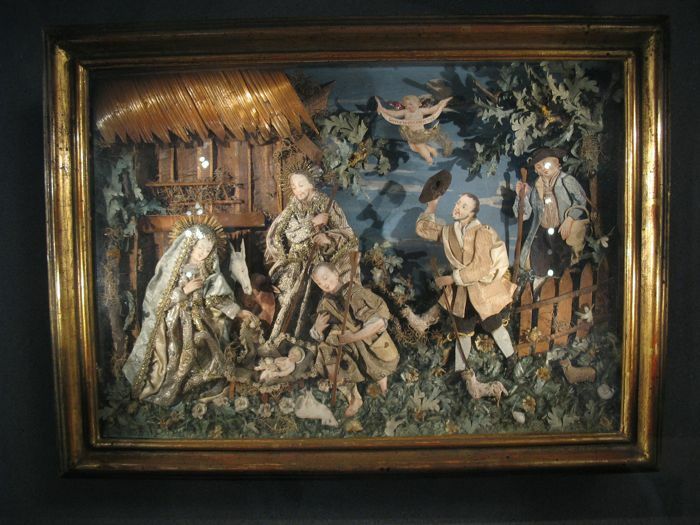 Many scenes are carved of wood, like this one. Some are made of paper, others are dolls dressed in the style of the times. The collection is enormous and dimly lit to preserve it, otherwise I’d have more photos. 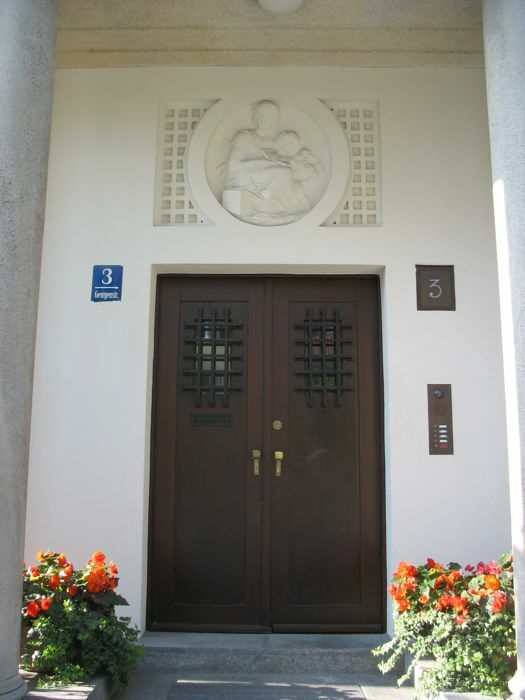 The whole ground floor on this side appears to be nativity scene after nativity, but it different formats than the traditional small creche that we see in the States. The one above was enormous, with a painted backdrop and molded stage. Several nativities were life size, and others were very tiny. One was made completely of paper–I’d say there were nearly a hundred different figurines in there–and others were minuscule, the figures no larger than a finger. My favorite by far was one where Joseph was knocking at the inn door, the light falling in a soft wedge across the town square, illuminating Mary, who was sitting, waiting, hunched on the edge of the fountain. I can see why the nobility liked having these in their homes–I could imagine Mary’s plight so much more clearly after looking at this scene. The museum houses the artistically most valuable and extensive crib collection in the world. Three geographical focal points characterise the collection, which contains more than 60 illusionistically designed crib images: the Alps, Naples and Sicily. 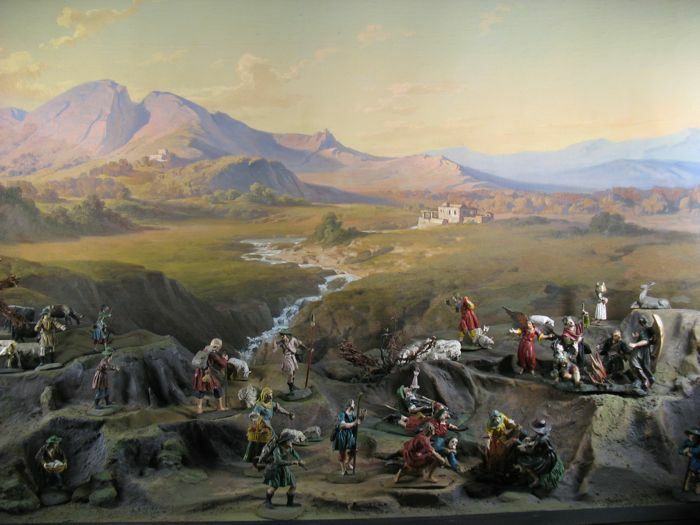 Primarily, many-figured nativity scenes, which were created between 1700 and the middle of the 19th Century are on display. 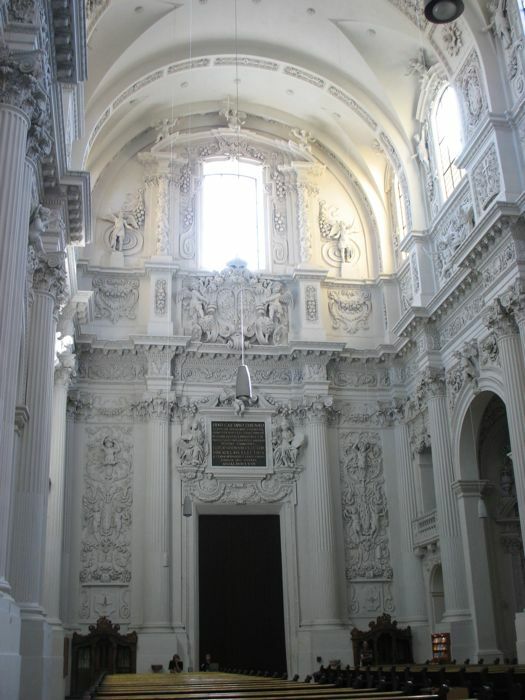 The cribs stem not only from churches, but inter alia, also from the Neapolitan court and the property of the Neapolitan nobility. It’s in German-translated-into-English, if you’re wondering. The German name for these is Krippen. By the way, a traveling exhibit of this was heralded in the New York Times in 1908, so yes, they’ve been around a while. I wandered through the rest of the museum, finally leaving when the screaming from a young child got to me. This family–and I–were the only ones there, and I wondered why they let him scream and scream. They also were tourists, from India. I did get to see this ethereal window, though. I went to Kafer on my way home, in order to pick up a lime green shopping bag, and snapped a photo of these candies all lined up, with marshmellows all aligned below. I wish I had lots more room in my suitcase! 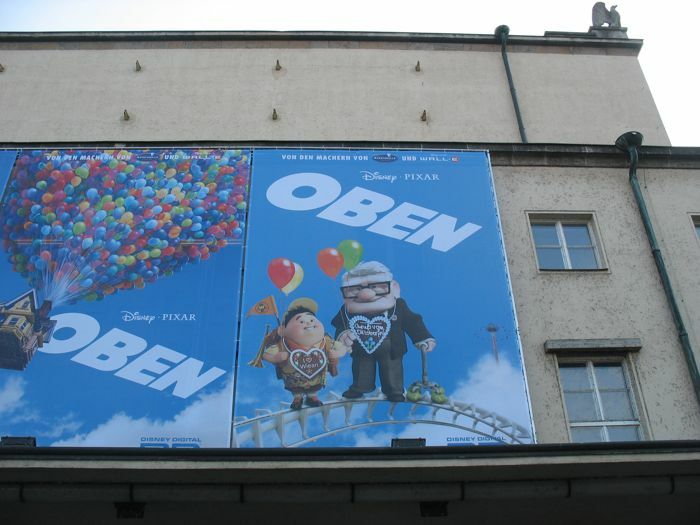 Then Dave and I headed down to the reception for all the scientists at his meeting, and on the way, we passed by the advertisement for the movie “Up.” We laughed that the main characters had the cookie hearts around their necks. The reception was held in the Deutsches Museum, in an upper room overlooking the main courtyard. They served us drinks, and I enjoyed that apple cider drink again, while we waited for the German equivalent to the Secretary of State to arrive. The room had busts of many favorite scientists around the room, with a caption identifying them. 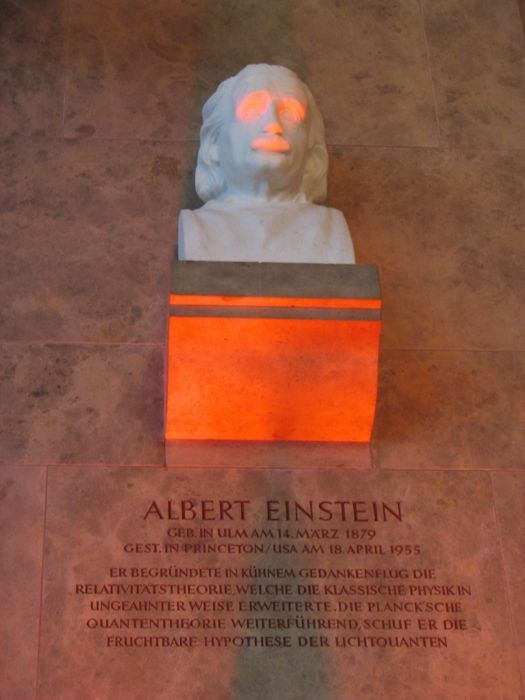 For some reason, they were uplit in bright orange light, giving Einstein a spooky glow just in time for Halloween. In a flurry, she arrived and we were distributed English tracts of her speech; she delivered it in German. After she spoke, they broke out the hor’douvres and desserts. That was enough dinner for us, so we headed home. I blogged some, answered email and was able to get to bed at a normal hour. Yay!